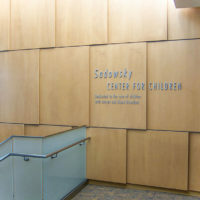 Lurie Children’s, a new 23-story hospital located in downtown Chicago adjacent to the Northwestern University Medical Campus, is a replacement facility for the former Children’s Memorial Hospital in suburban Lincoln Park. 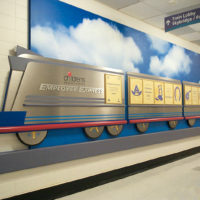 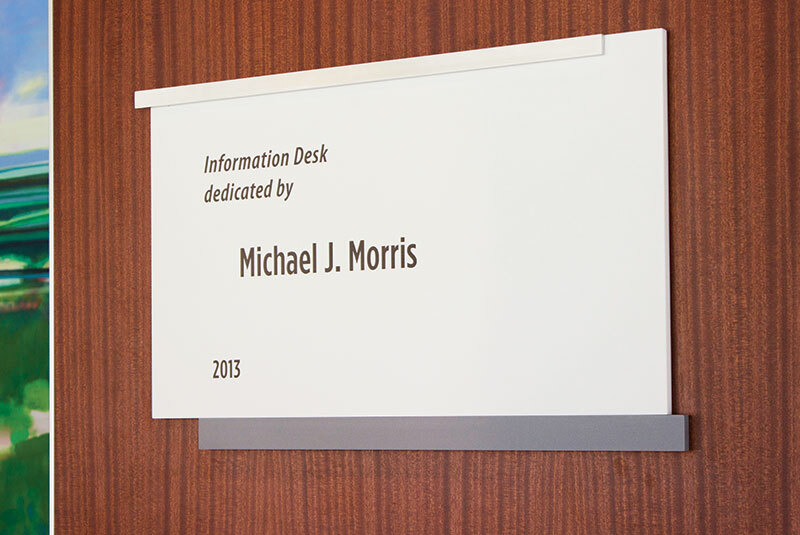 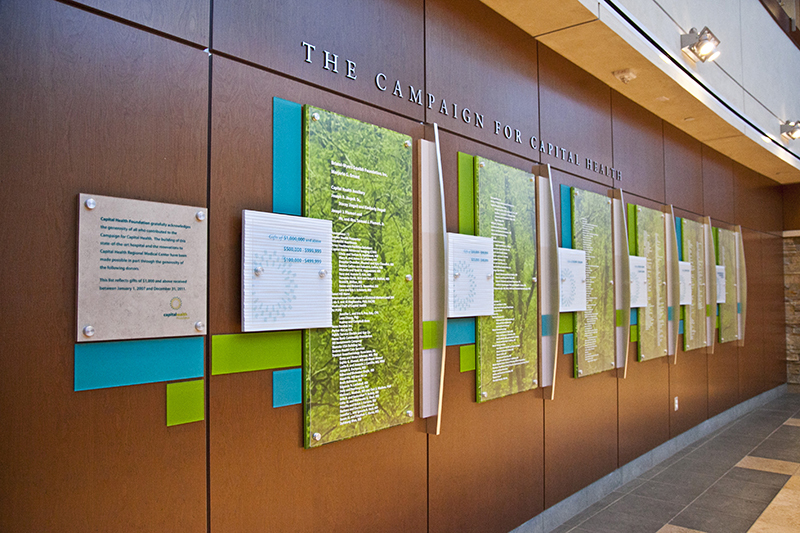 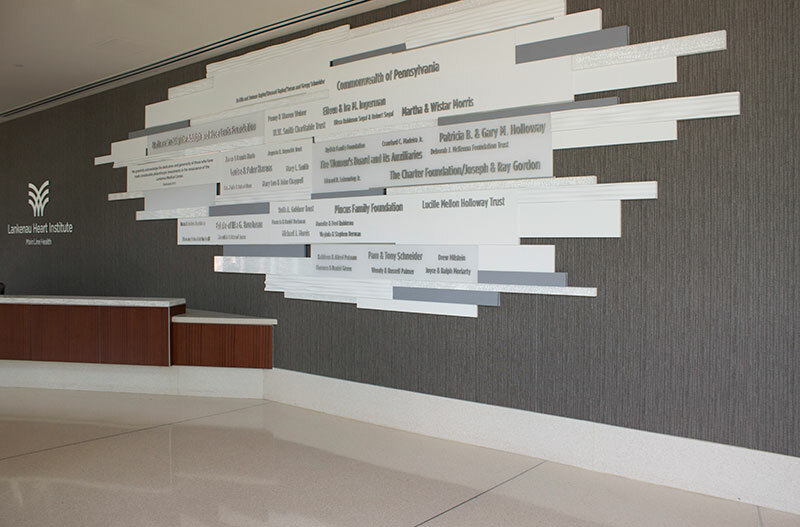 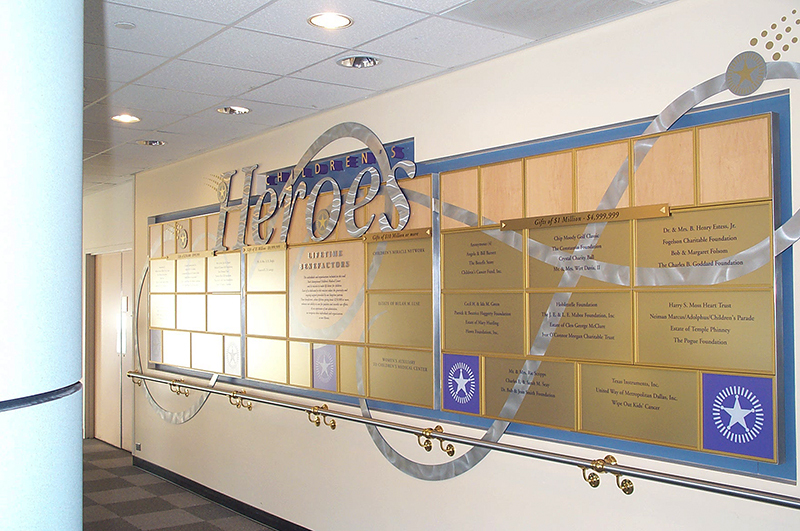 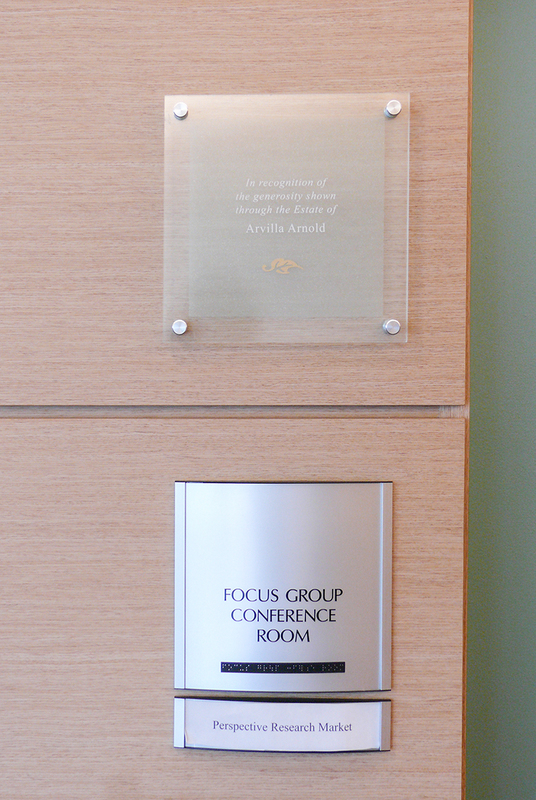 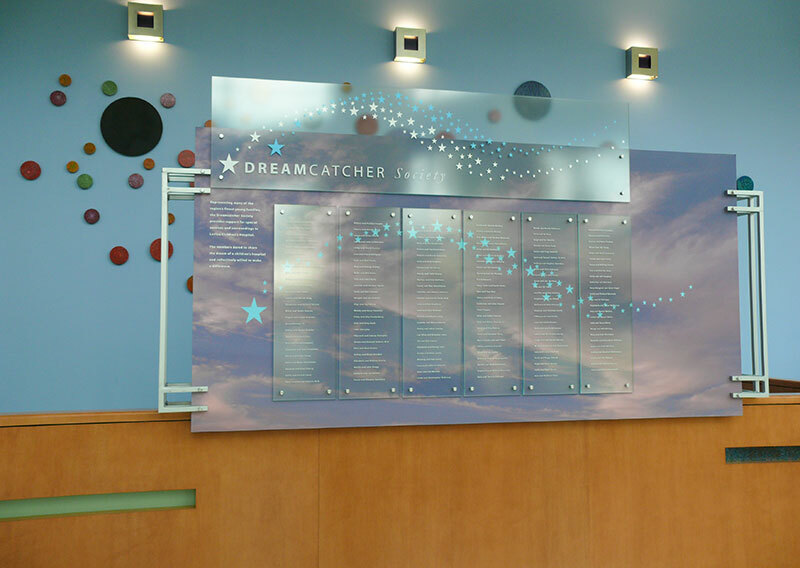 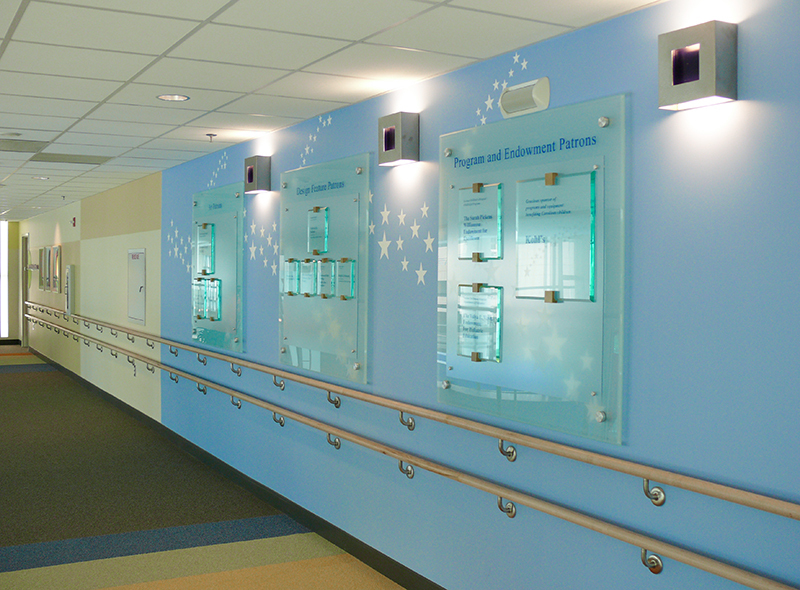 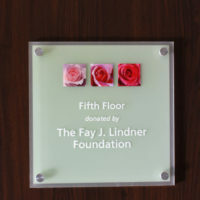 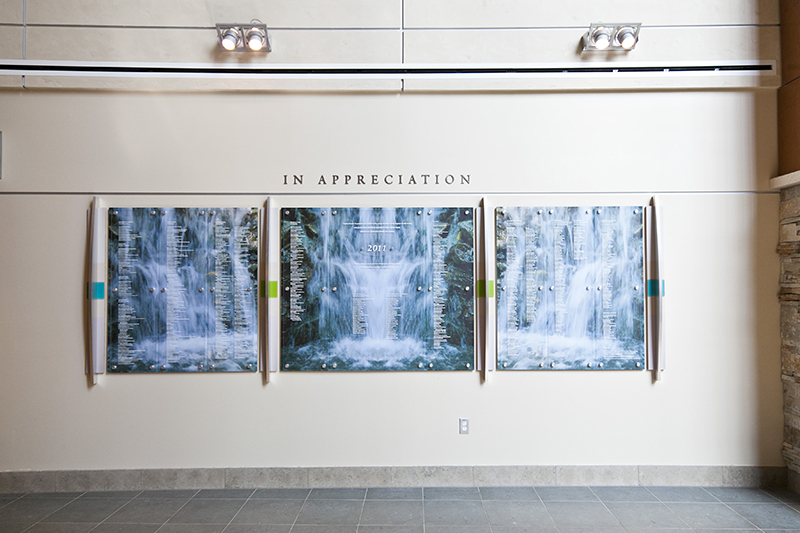 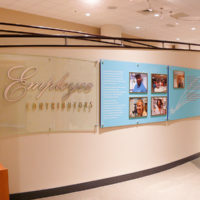 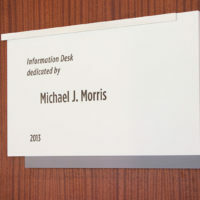 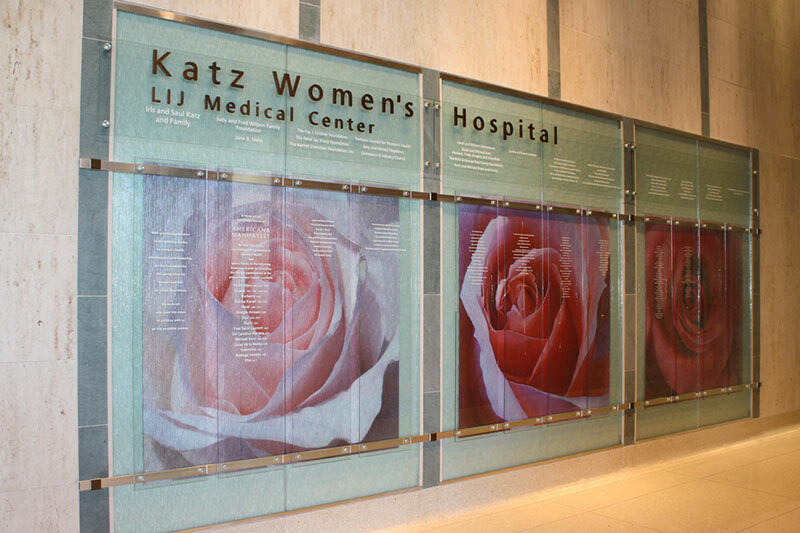 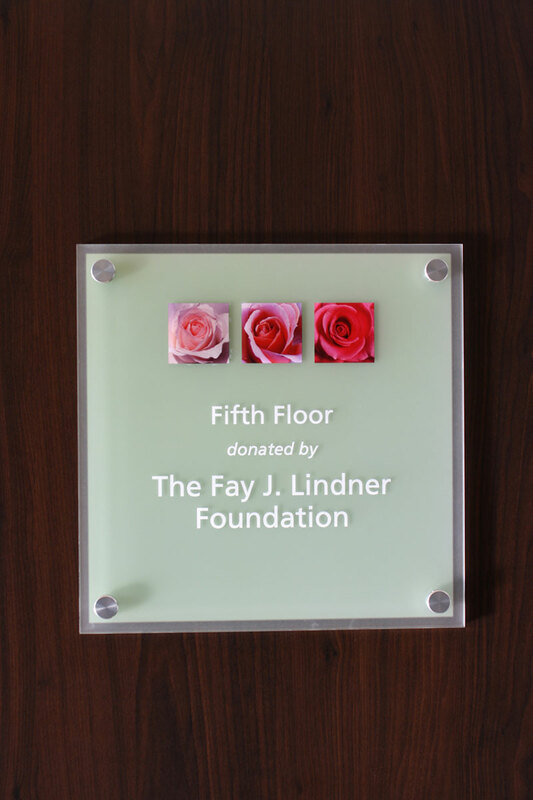 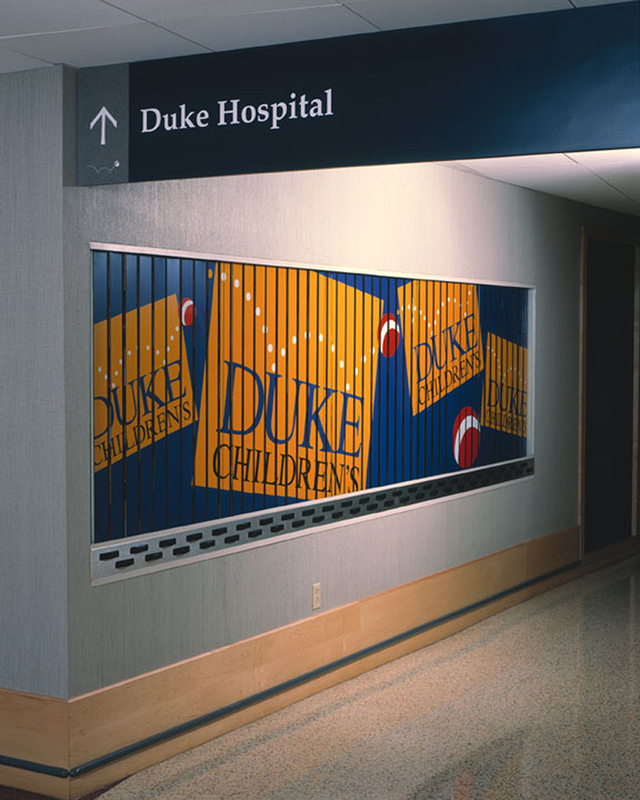 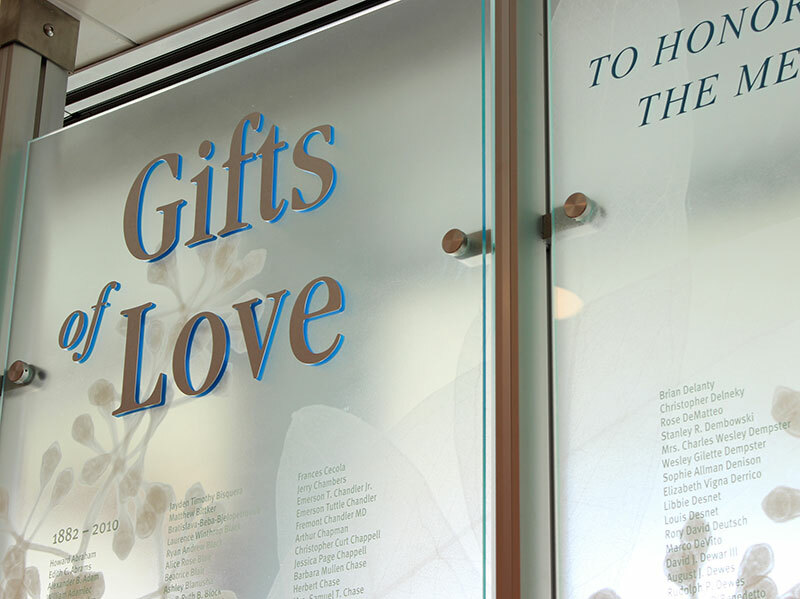 The Mitchell graphics team designed interior and exterior signage, wayfinding, super graphics, photo murals, and donor recognition for the project. 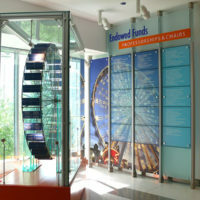 Themed donor recognition designs compliment building finishes and include 11 major campaign displays, featuring a powered 5-foot diameter Ferris wheel inspired by the famous Navy Pier Ferris Wheel, a community partner executed mosaic tile wall, and a 45-foot Capital Campaign window wall installation with programmed LED “fireworks” light display. 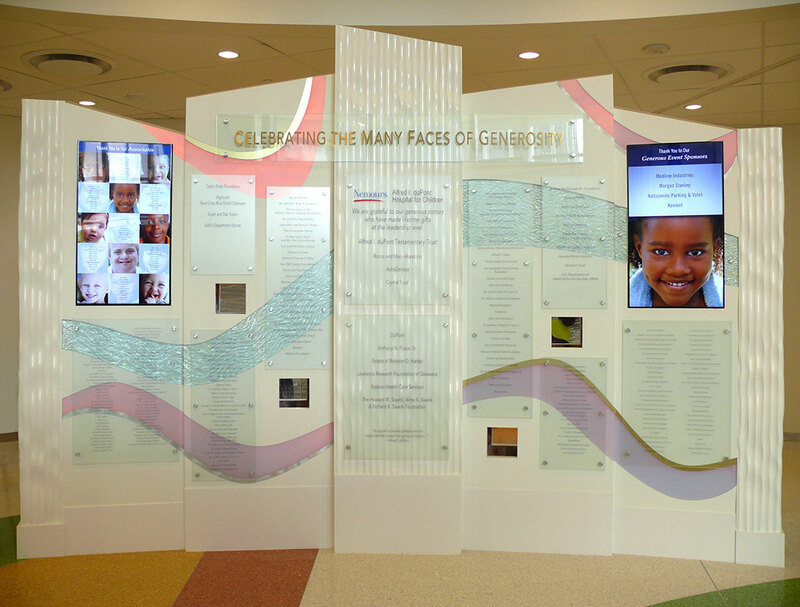 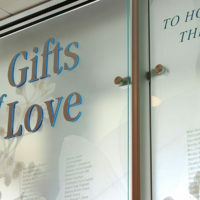 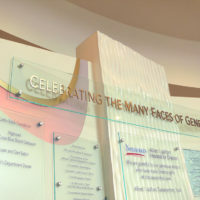 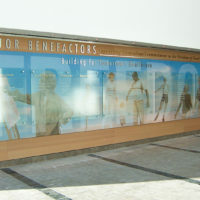 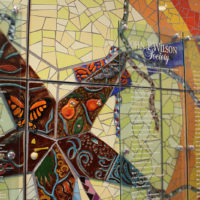 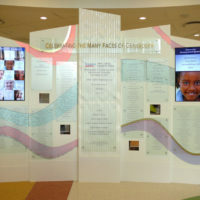 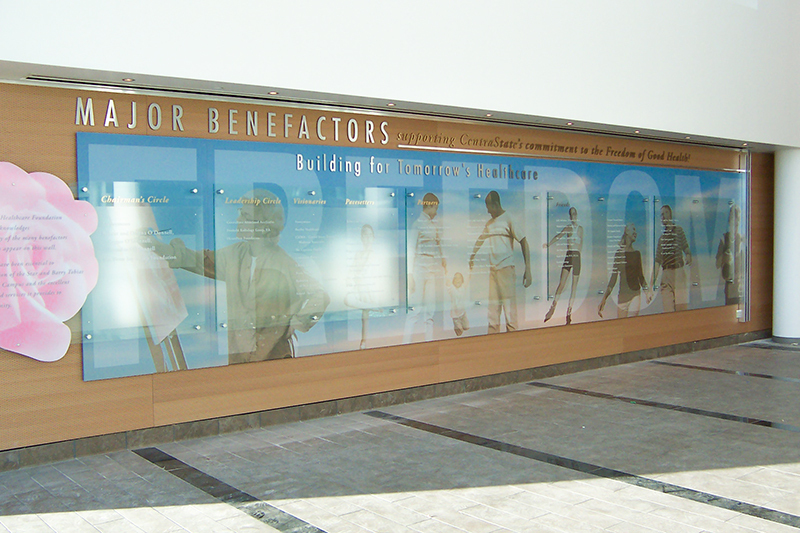 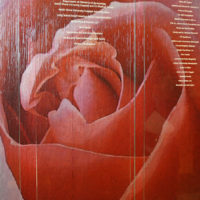 “The Many Faces of Generosity”, the notion that you can be a part of the support, was the theme for this Capital Campaign donor and marketing display. 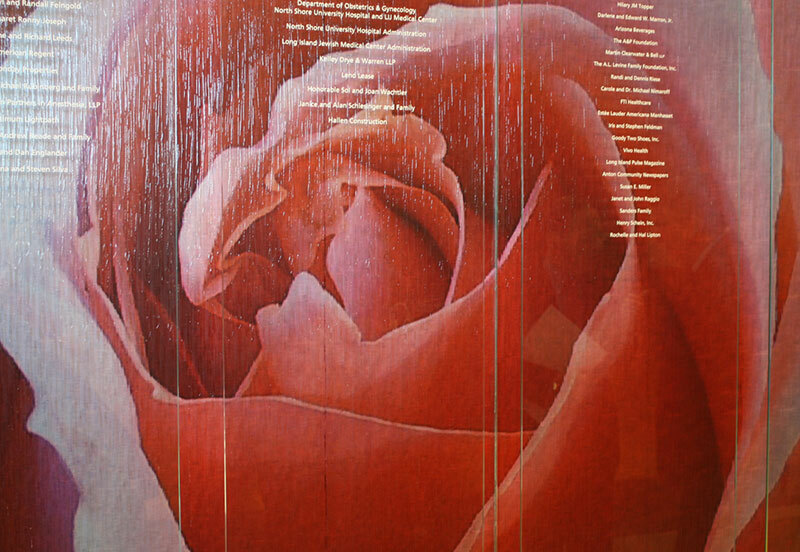 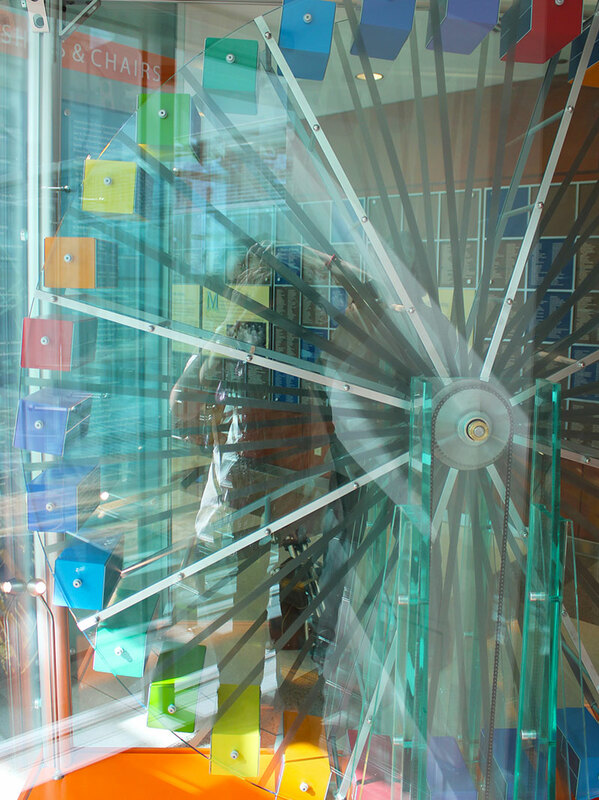 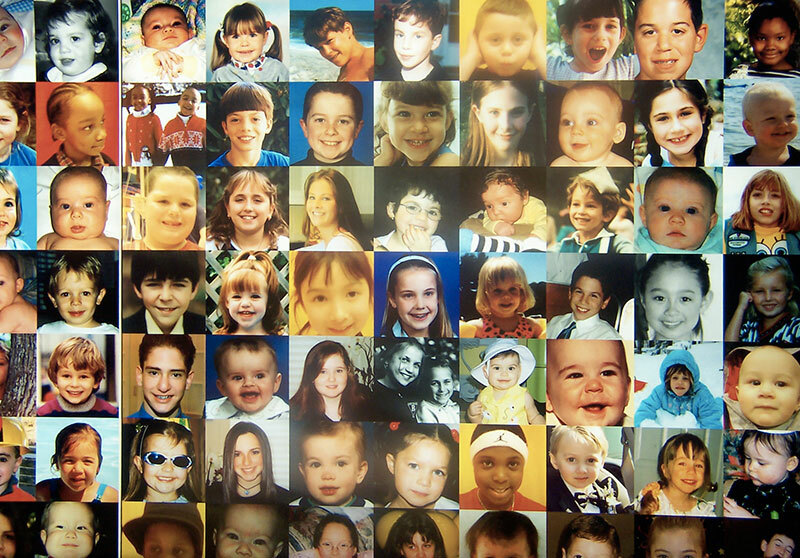 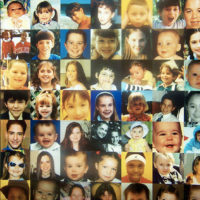 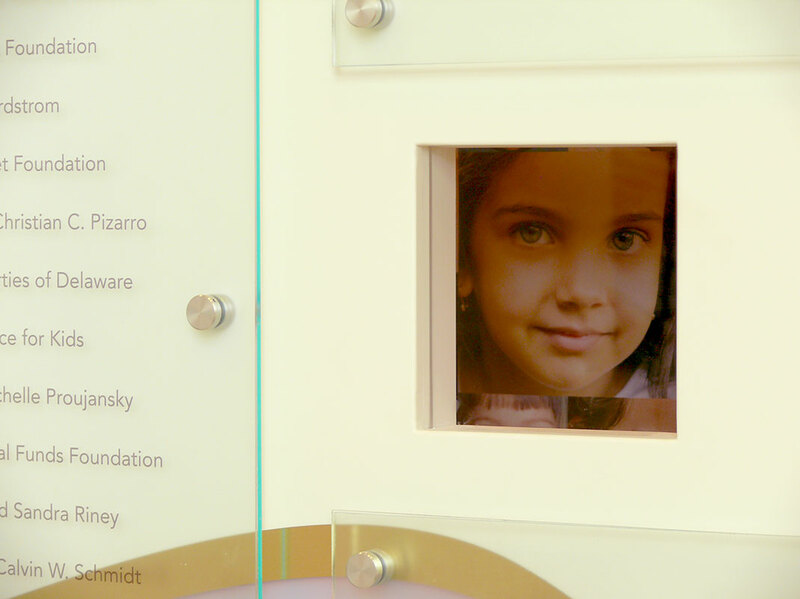 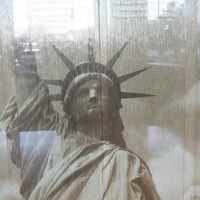 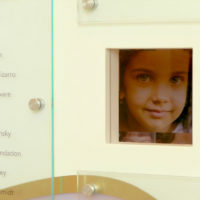 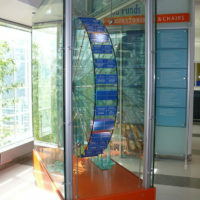 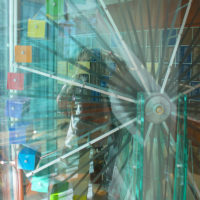 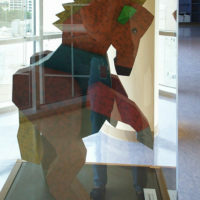 A “low-tech” interactive component was designed to reflect ones face in a photo collage of children’s faces while looking into window cut-outs on the display front. 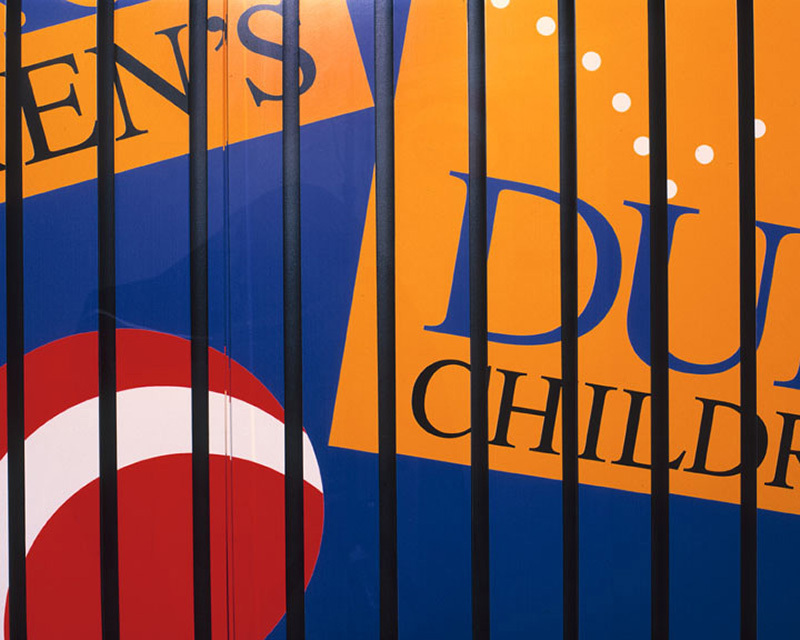 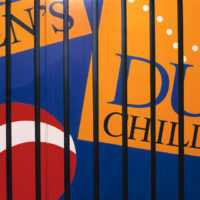 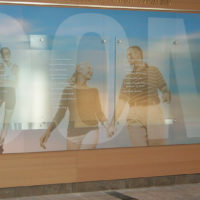 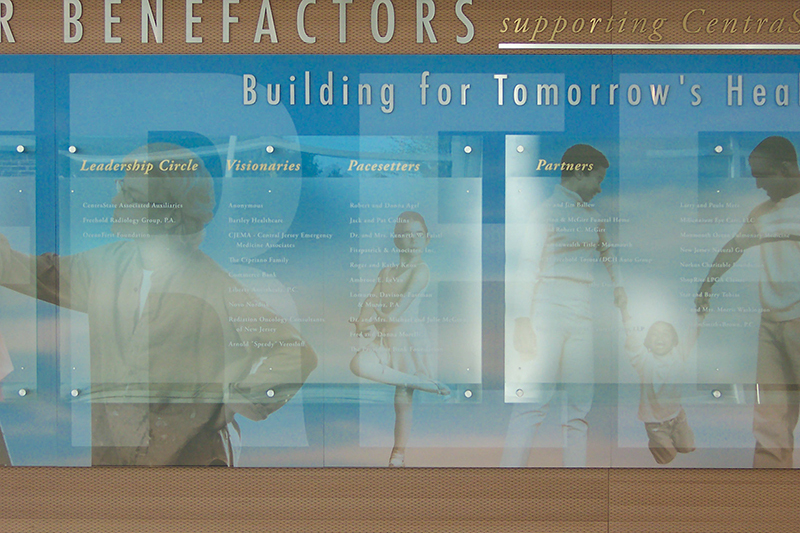 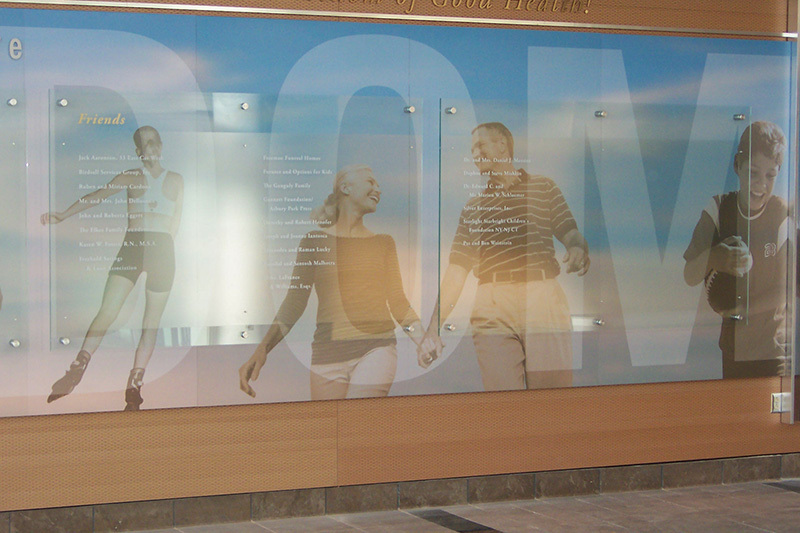 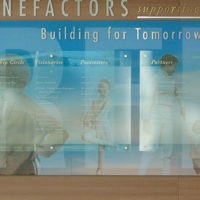 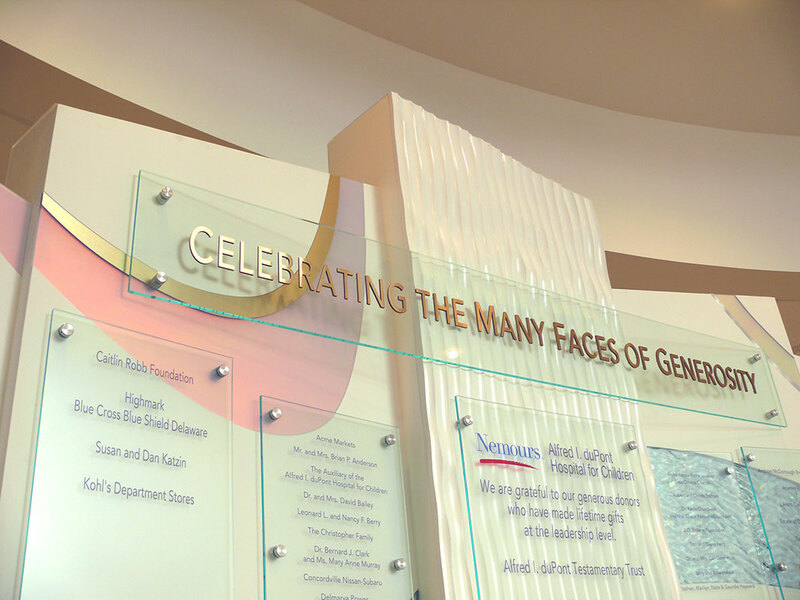 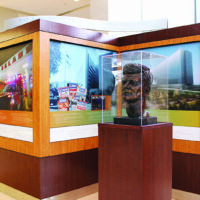 Digital LCD screens feature changeable content developed by Nemours marketing. 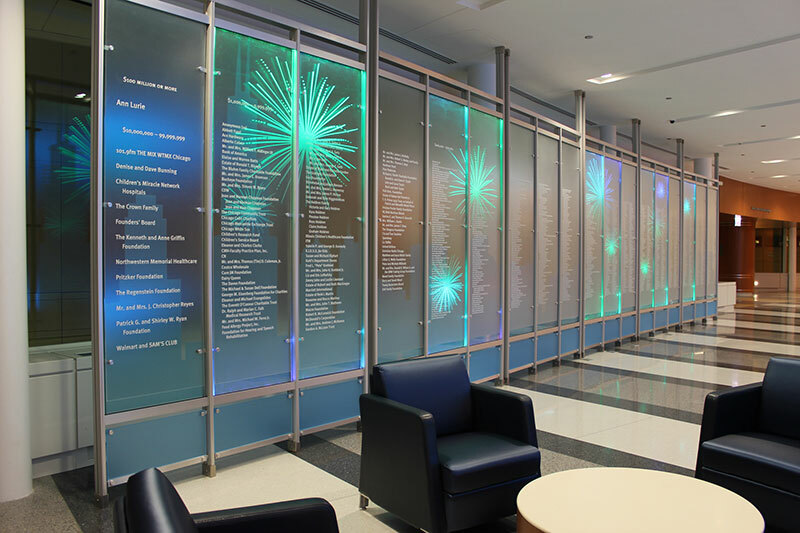 Consistent with the new and colorful Atrium space, display materials included color changing dichroic panels and textured laminate surfaces. 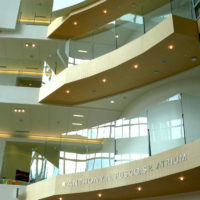 Curves, angles and shapes on the display complement the unusual architectural shapes and details of the atrium space. 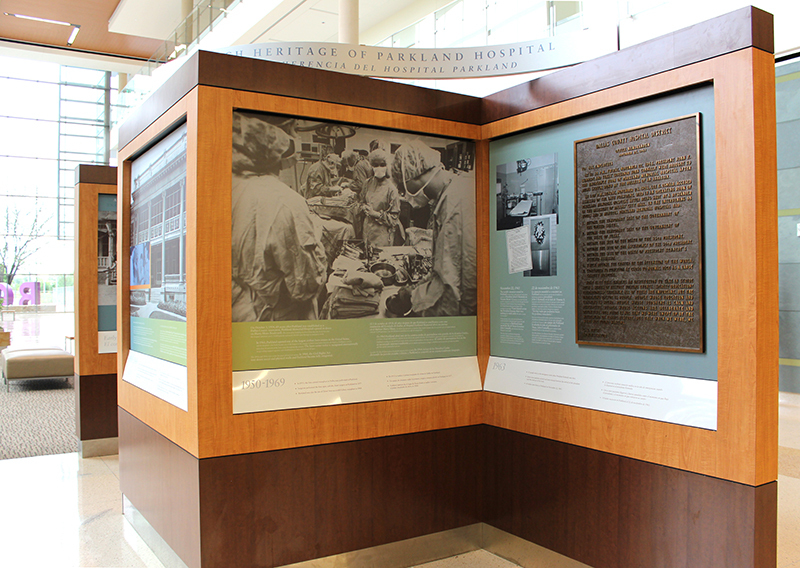 Parkland Health and Hospital System completed a new replacement hospital campus directly adjacent to its current campus along Harry Hines Boulevard in the Medical District area of Dallas. 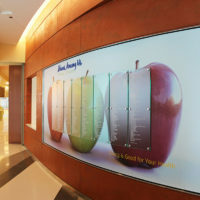 The New Parkland Hospital is approximately 2.7 million square feet of new construction including a 17-story patient tower, 9-story women and infant specialty hospital (WISH), medical/surgical clinic, WISH clinic, 2,000 vehicle parking garage, bridge connection to UT Southwestern and Children’s Medical Center, and new logistics and central utility plant. 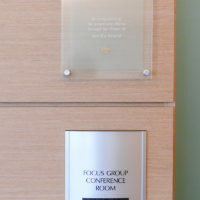 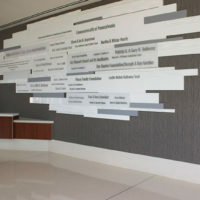 Mitchell and their local teaming partner, focus EGD, provided design services for all wayfinding, graphics, signage, and donor recognition for interior and exterior spaces on the new 16+ acre campus. 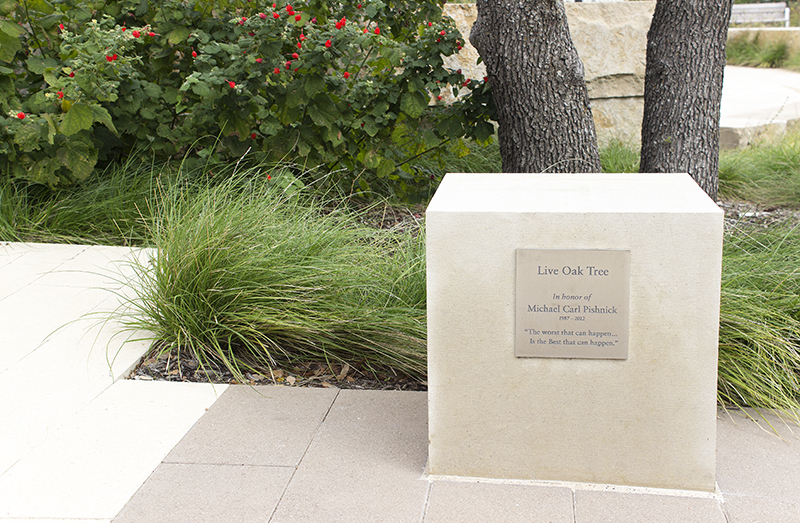 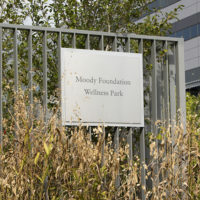 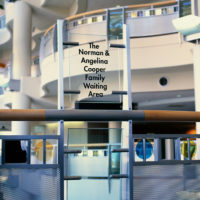 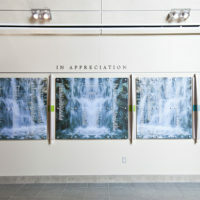 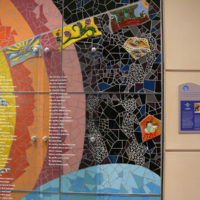 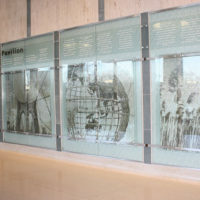 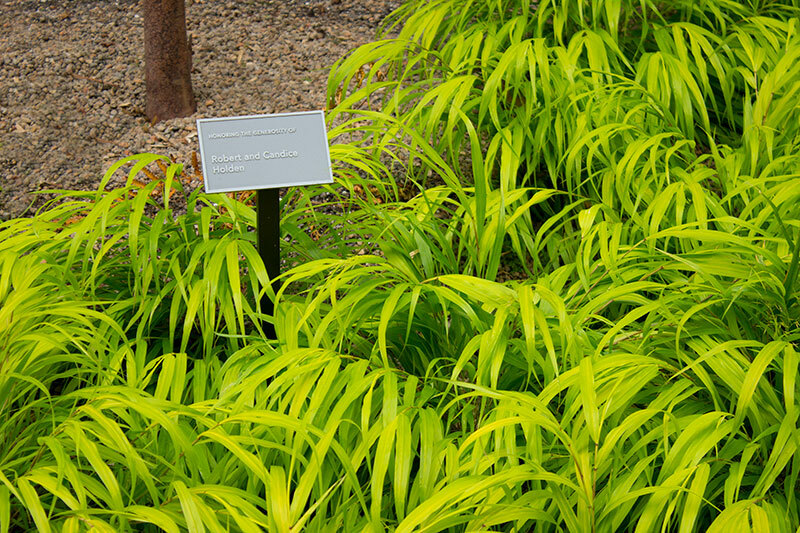 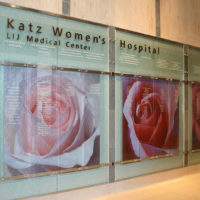 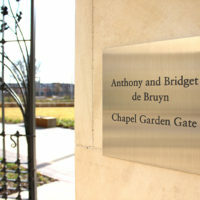 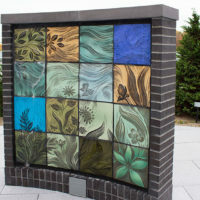 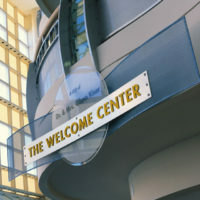 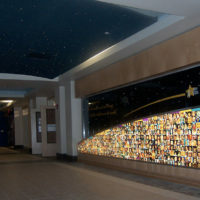 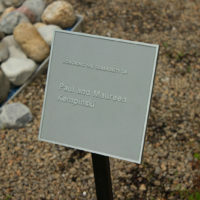 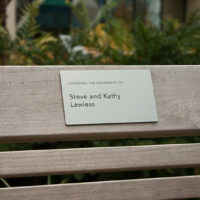 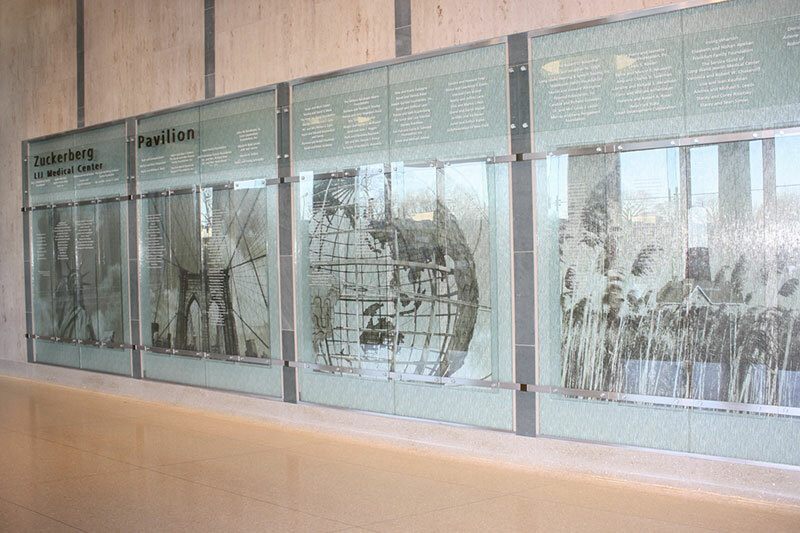 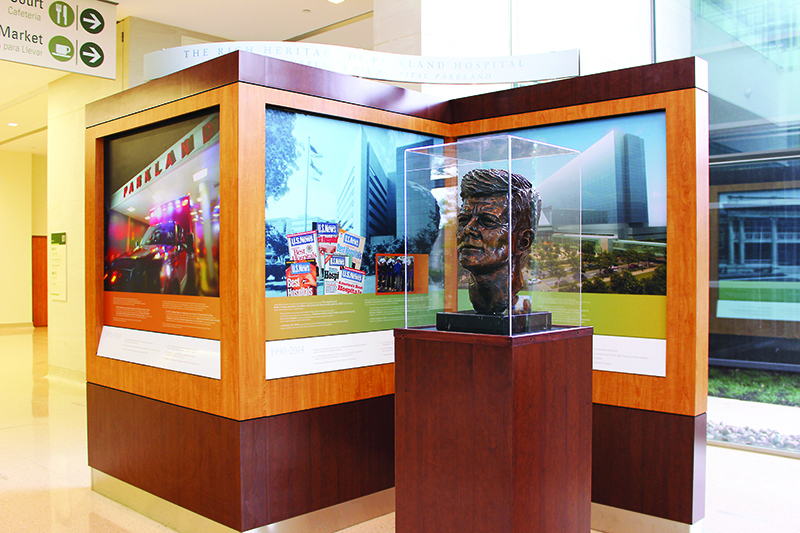 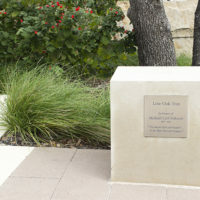 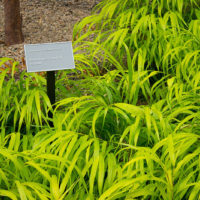 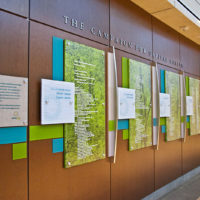 The program includes a comprehensive building numbering system, exterior visual branding, digital wayfinding kiosks, 10 major interior recognition and interactive displays, recognition plaques for a series of “parks”, plazas, and gardens on the campus, and parking garage signage and level graphics based on abstracted nature images. 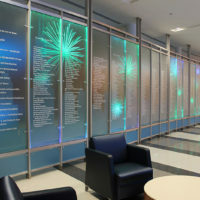 The Interdisciplinary Science and Engineering Laboratory (ISE Lab) is a 194,000-square-foot facility with research laboratories that house teams from the colleges of Engineering, Arts and Sciences, Agriculture and Natural Resources, Earth, Ocean, and Environment. 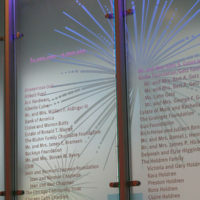 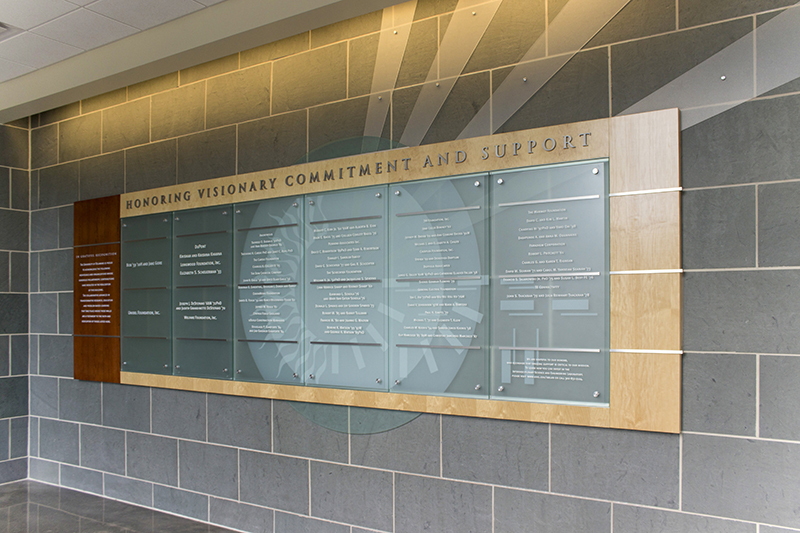 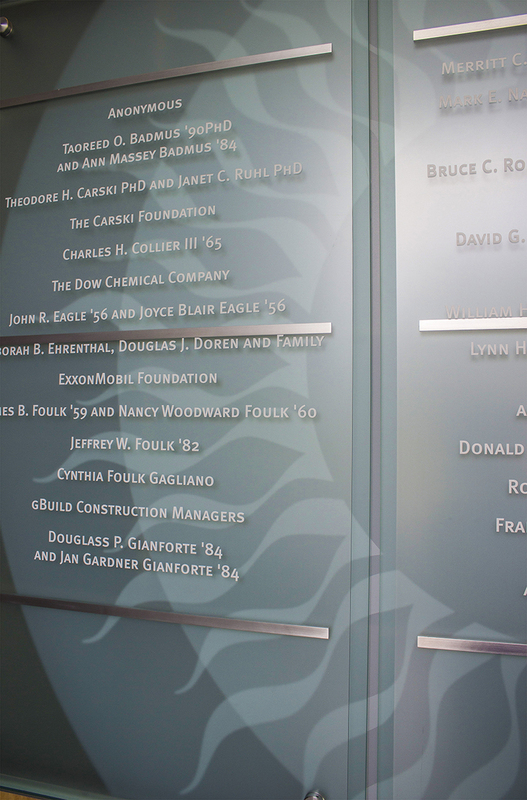 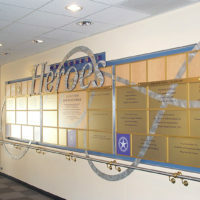 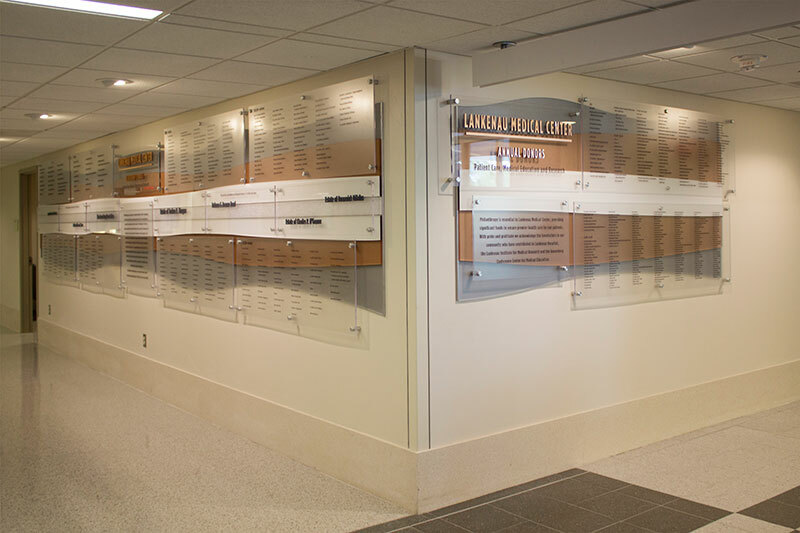 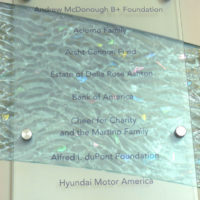 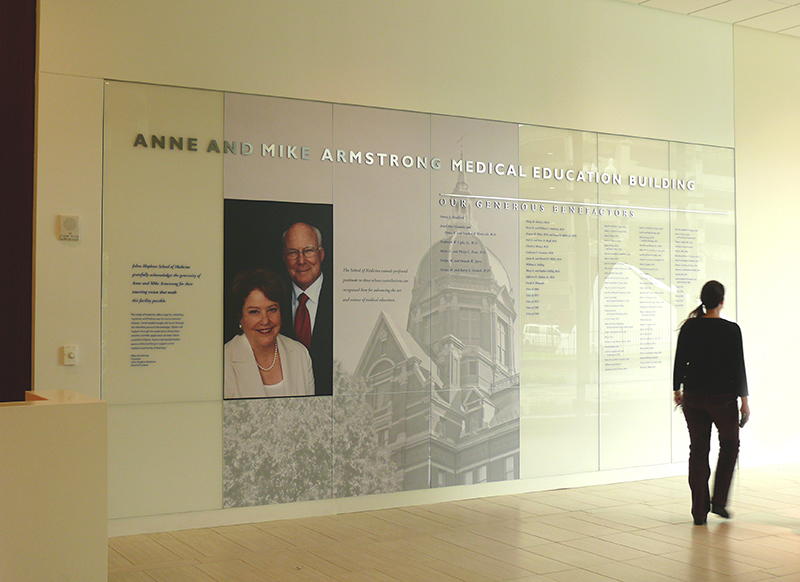 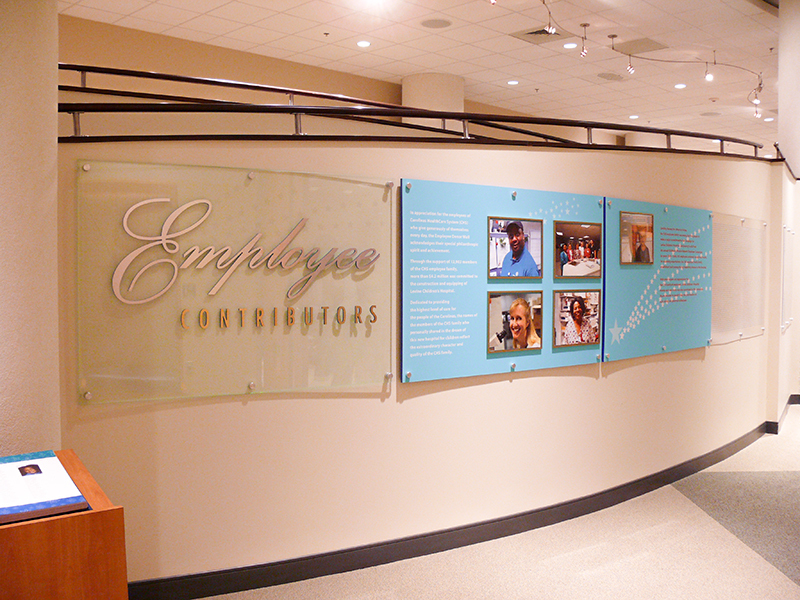 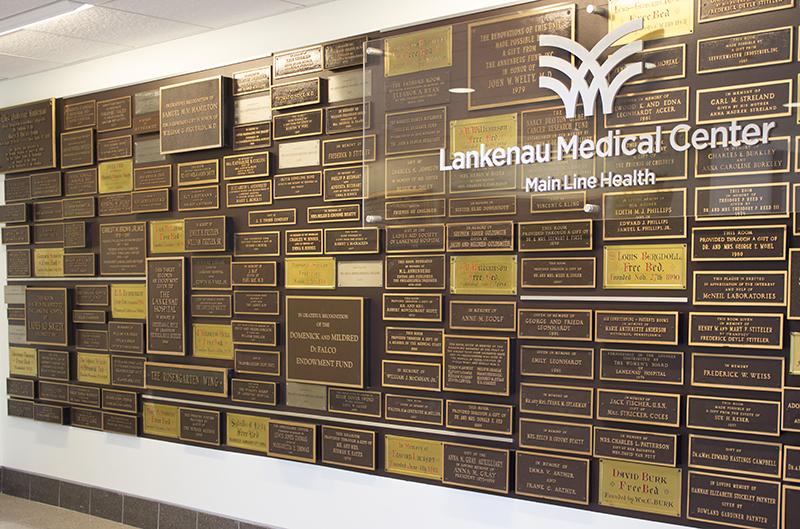 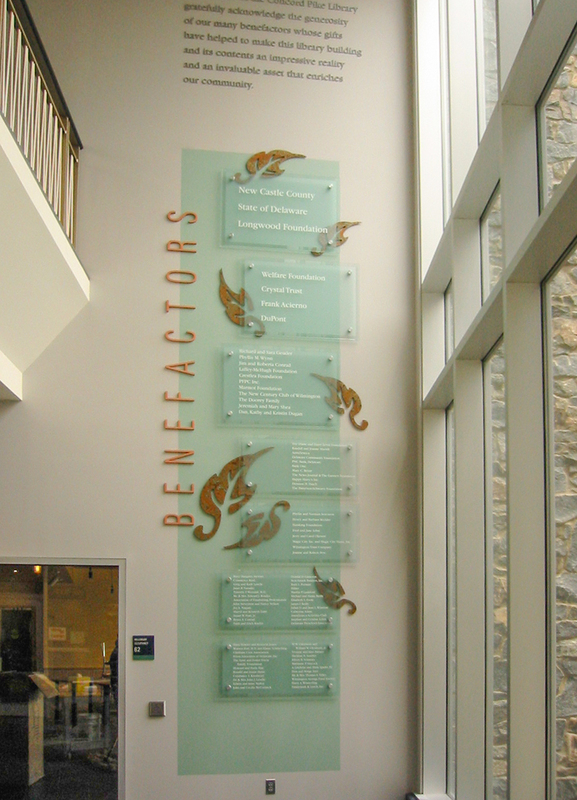 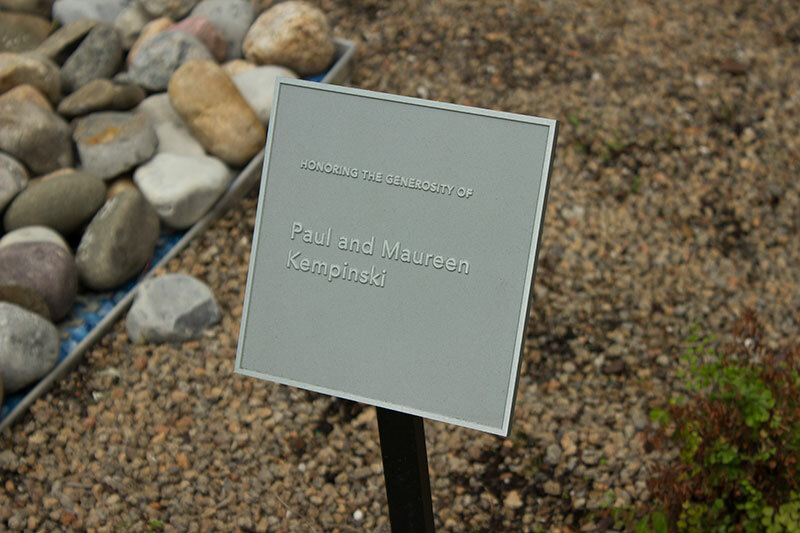 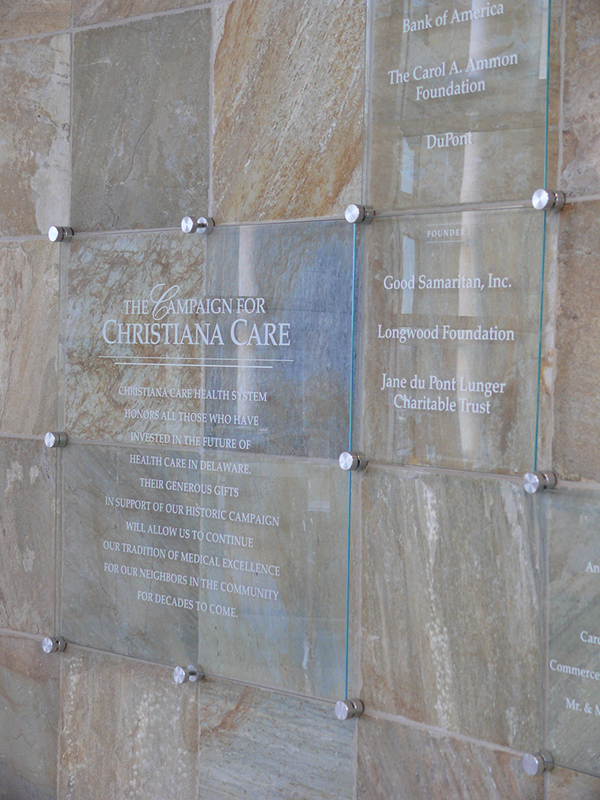 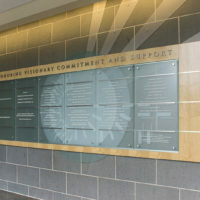 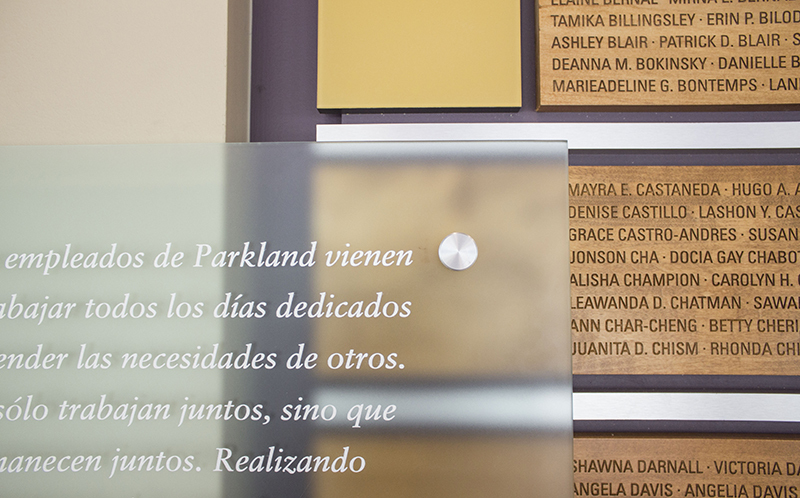 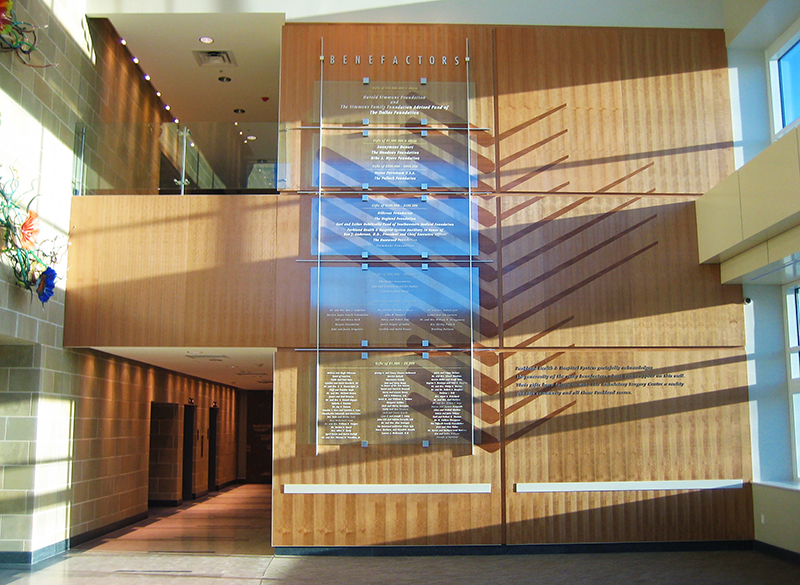 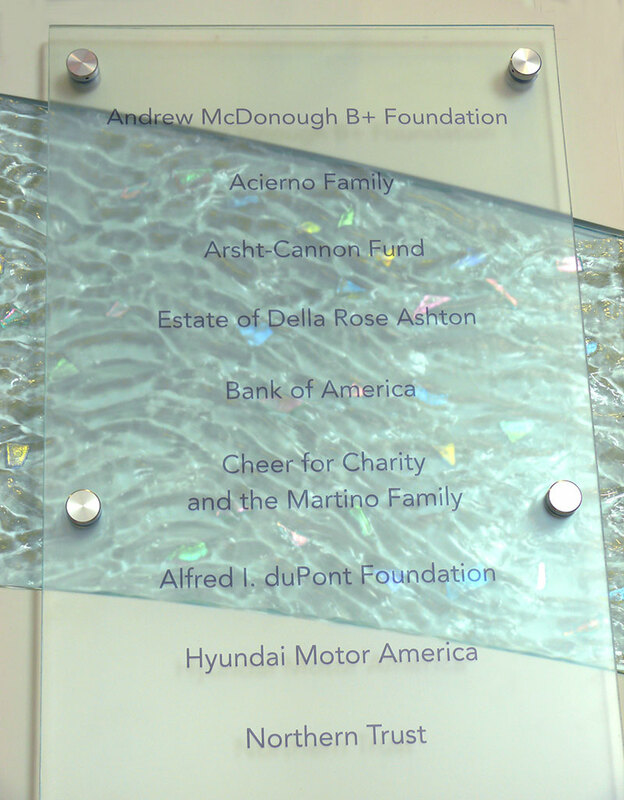 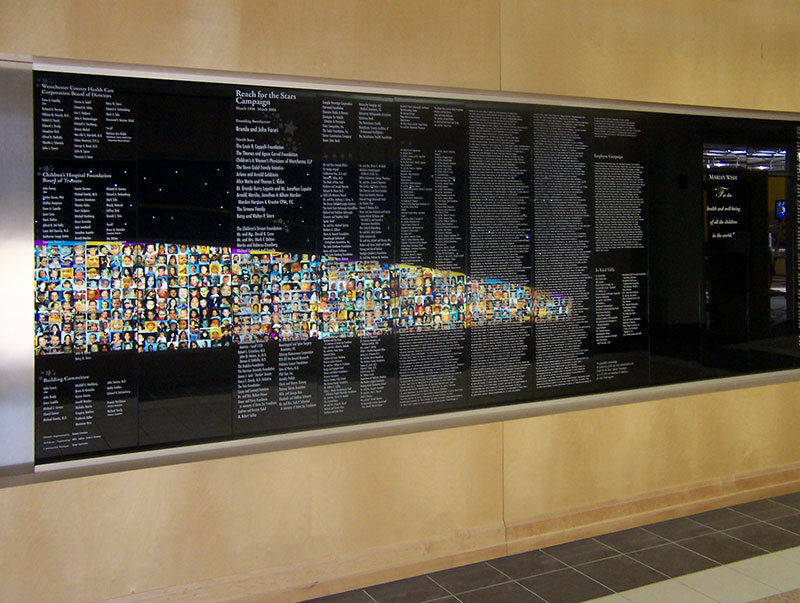 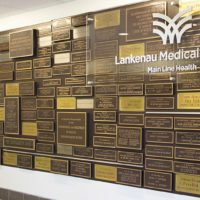 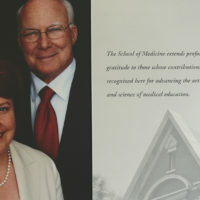 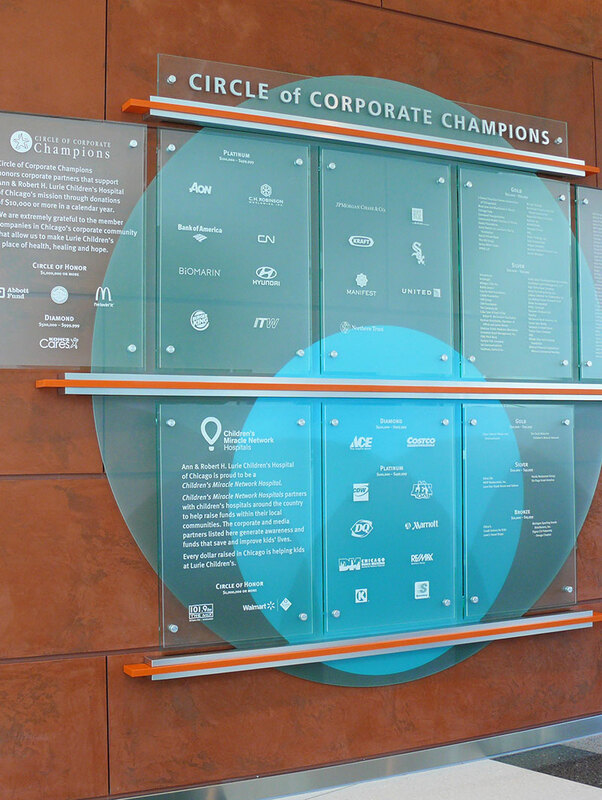 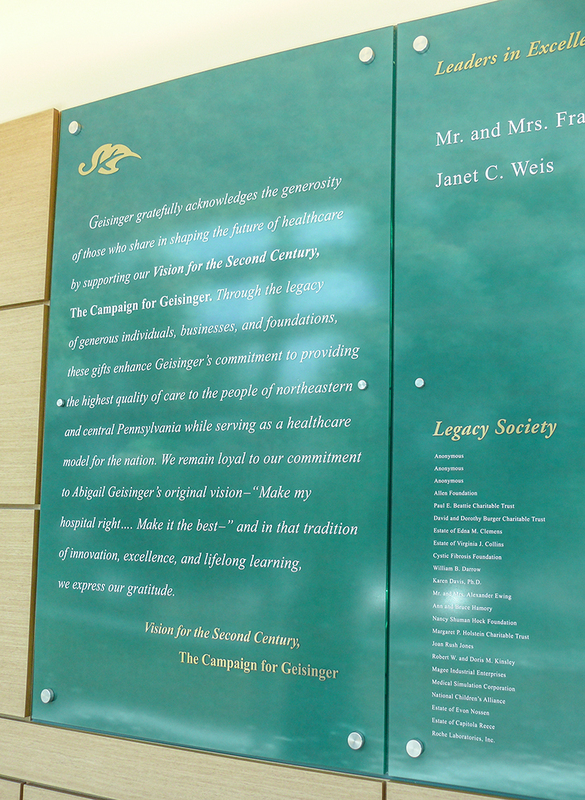 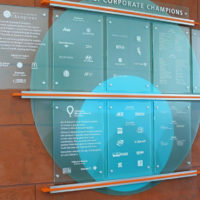 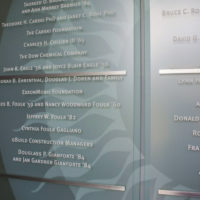 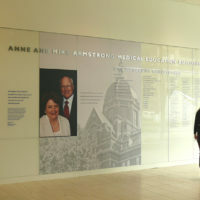 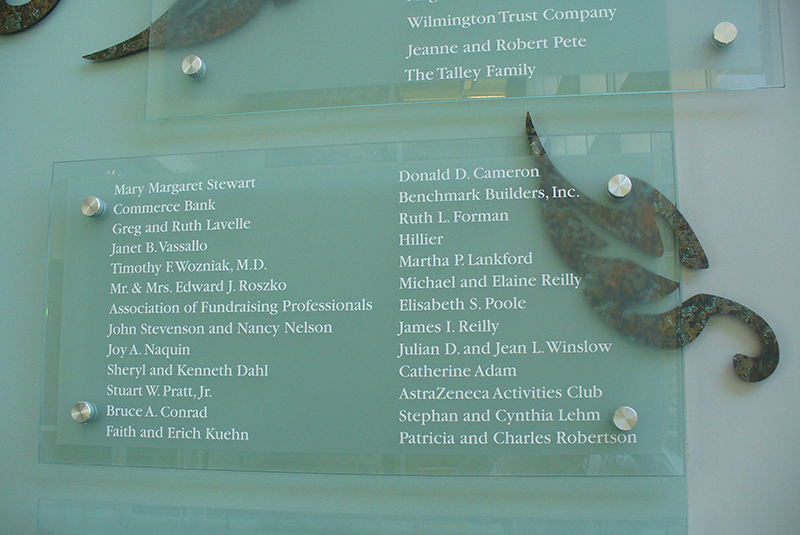 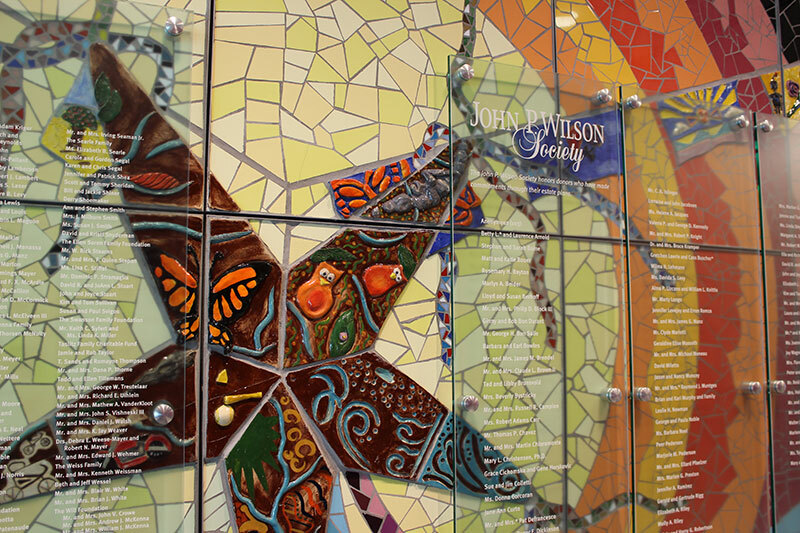 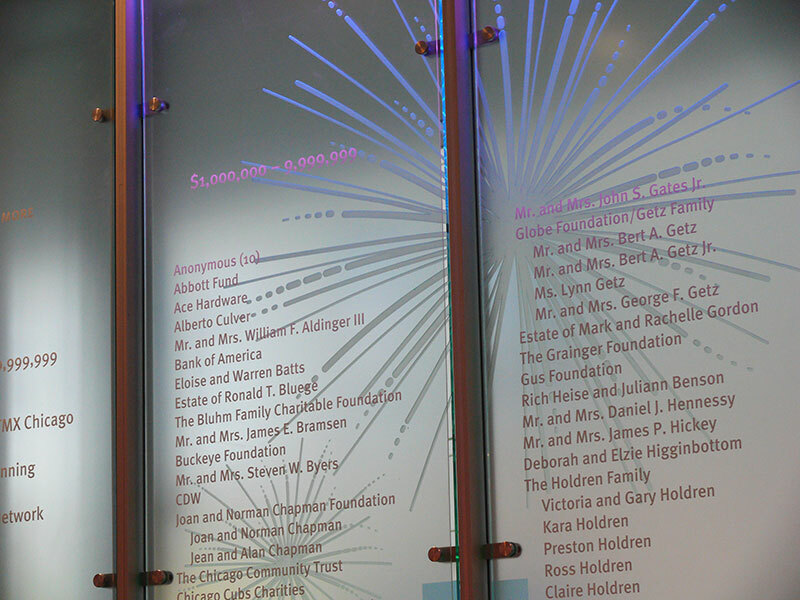 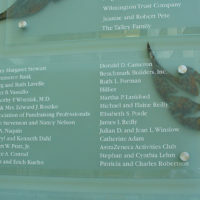 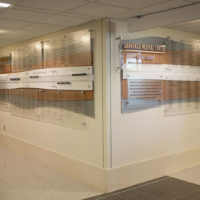 The donor recognition display honors companies and individuals who have made generous commitments to the construction of the new ISE Lab and programs housed in this facility. 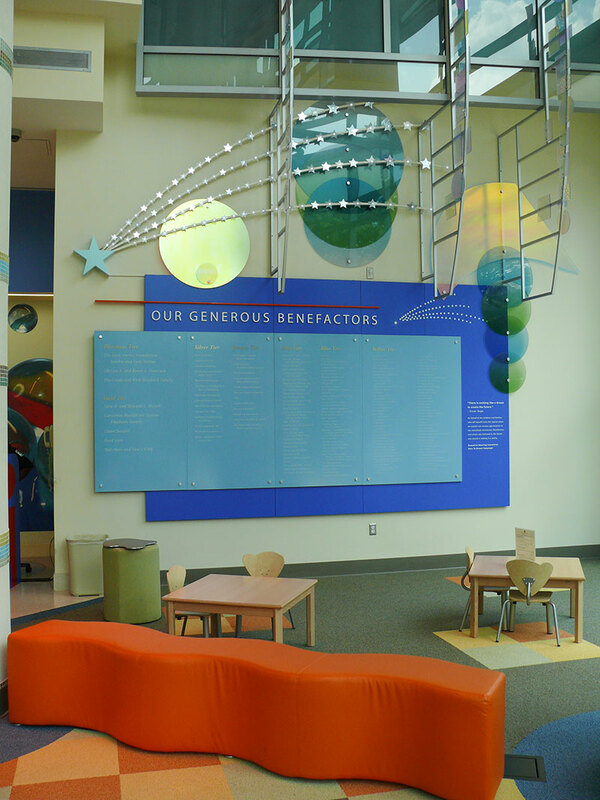 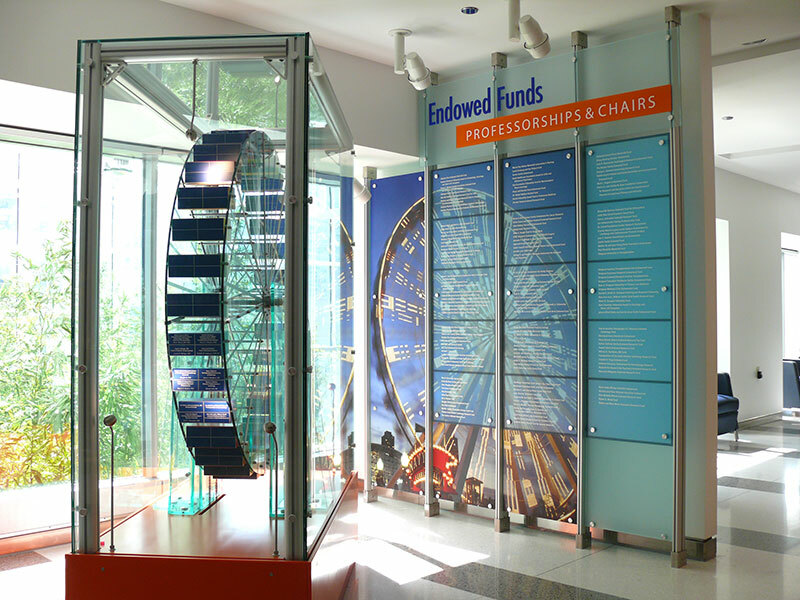 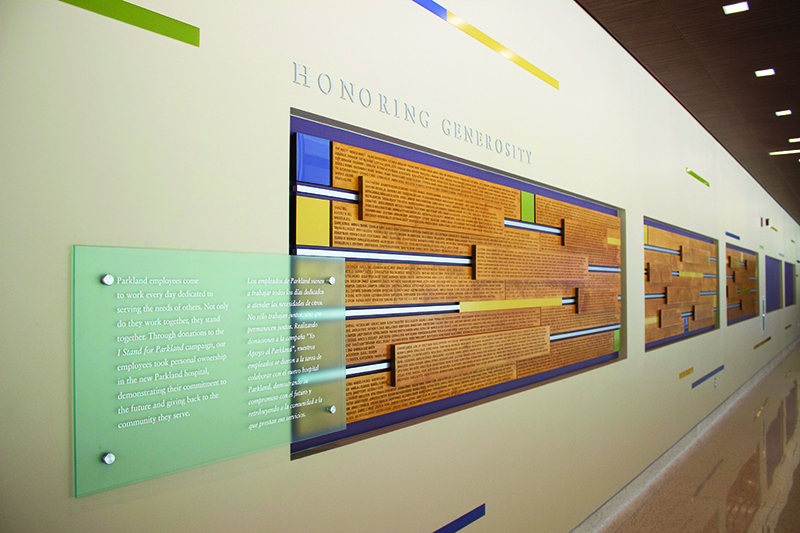 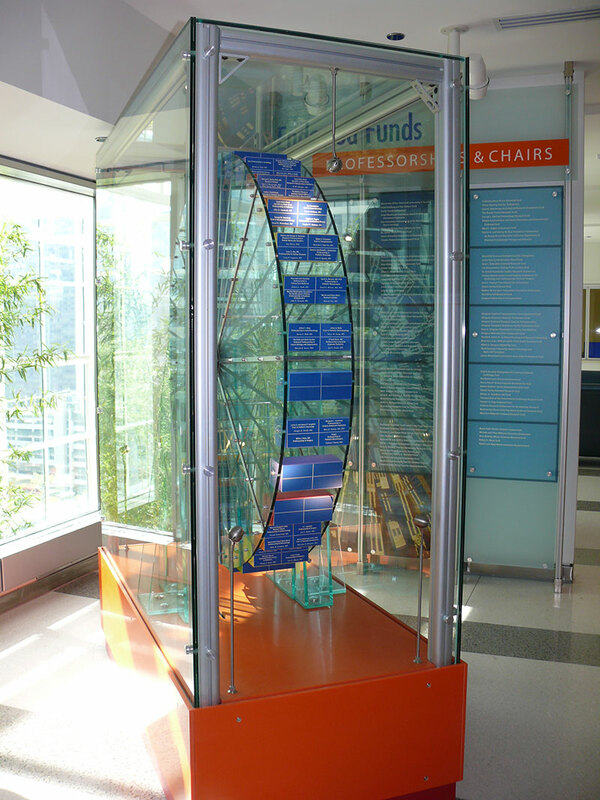 The donor display design reflects natural elements of earth, sun, and water through graphic imagery, color, and wood material selections. 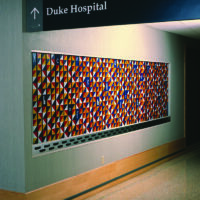 The display integrates into the architectural space by aligning with the dimension of background glazed wall tile modules. 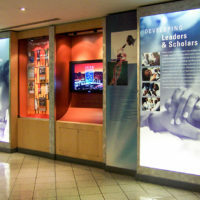 Natural lighting from a window wall facing the display and interior LED cove lighting above provides illumination for the display. 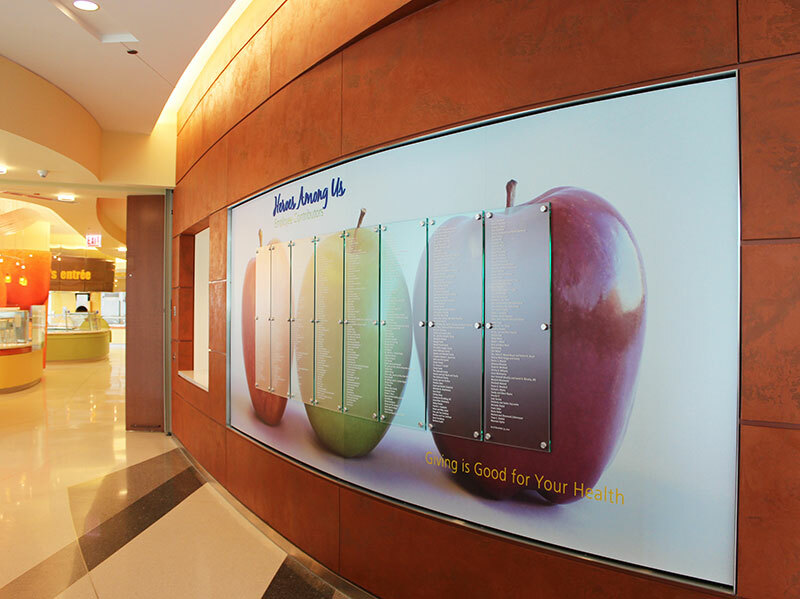 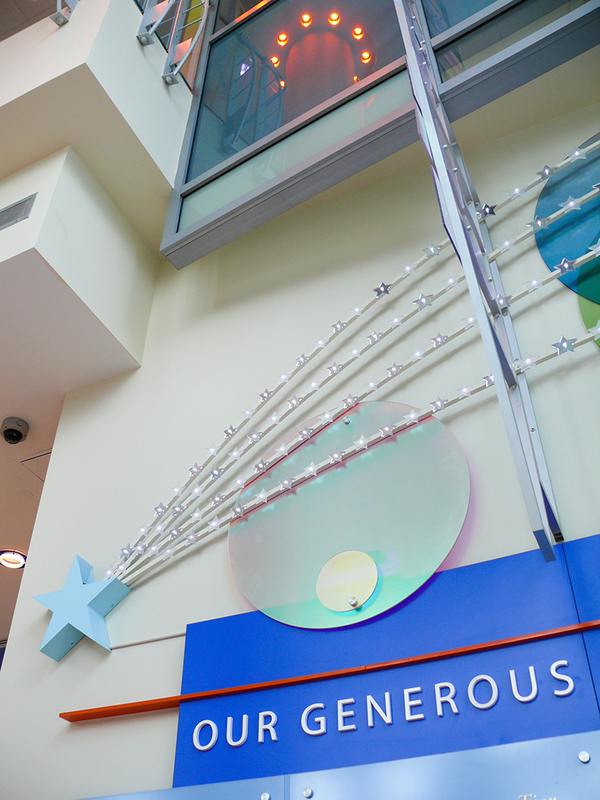 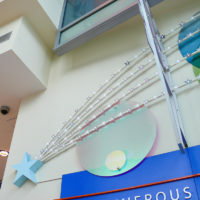 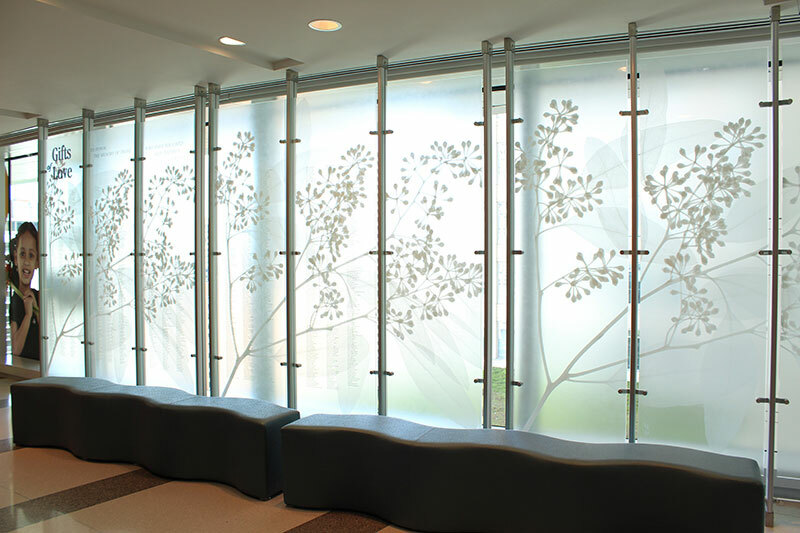 Levine Children’s Hospital has a large, high entrance lobby with 3-story exterior glass walls that wrap around half of the building space. 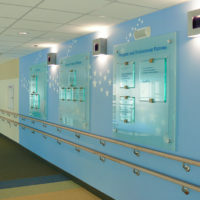 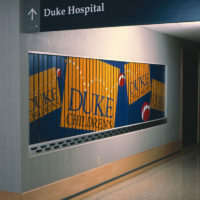 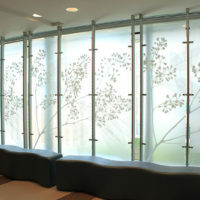 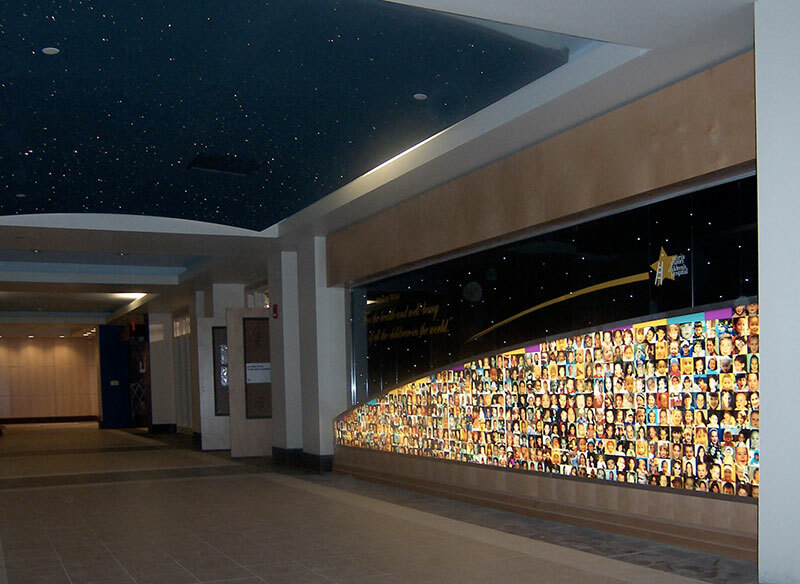 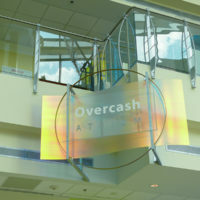 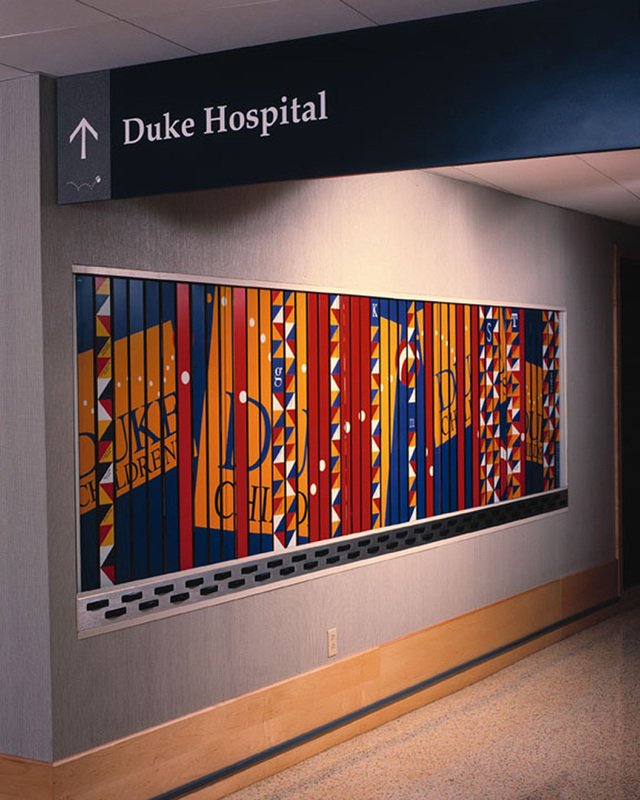 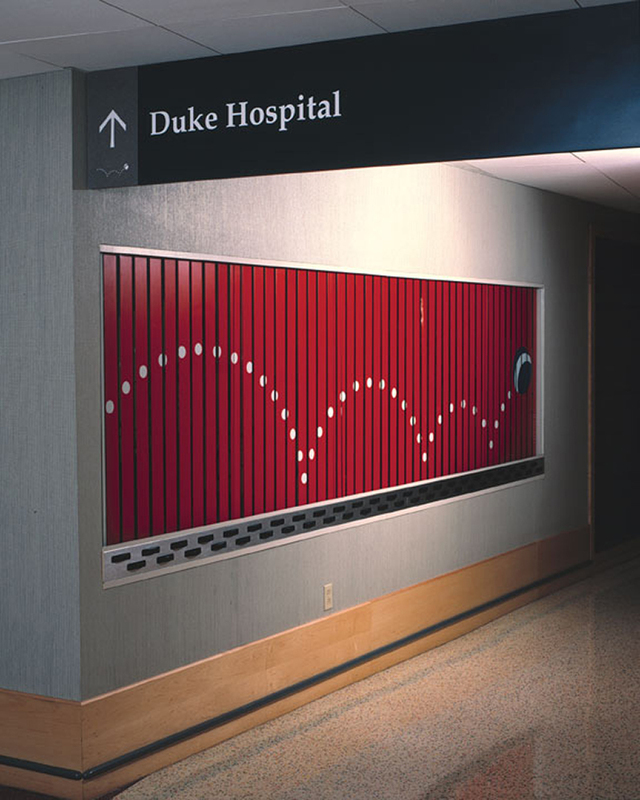 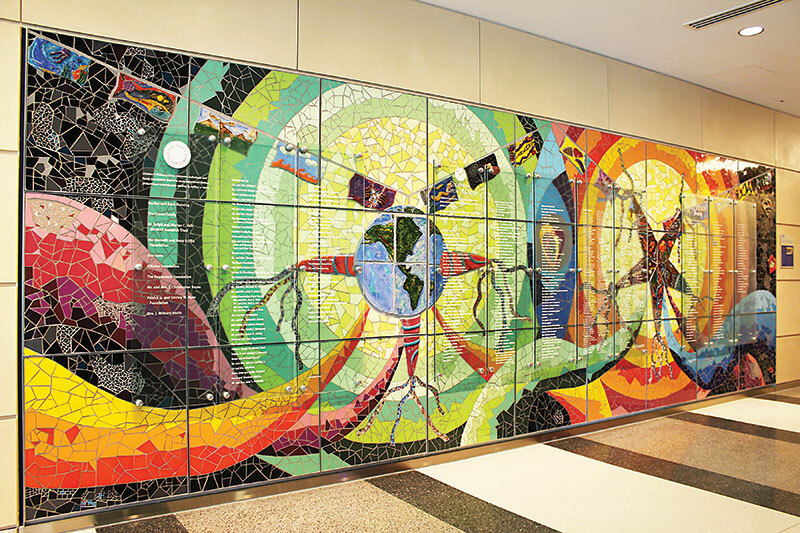 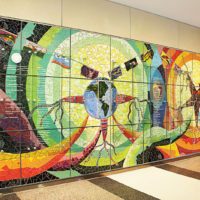 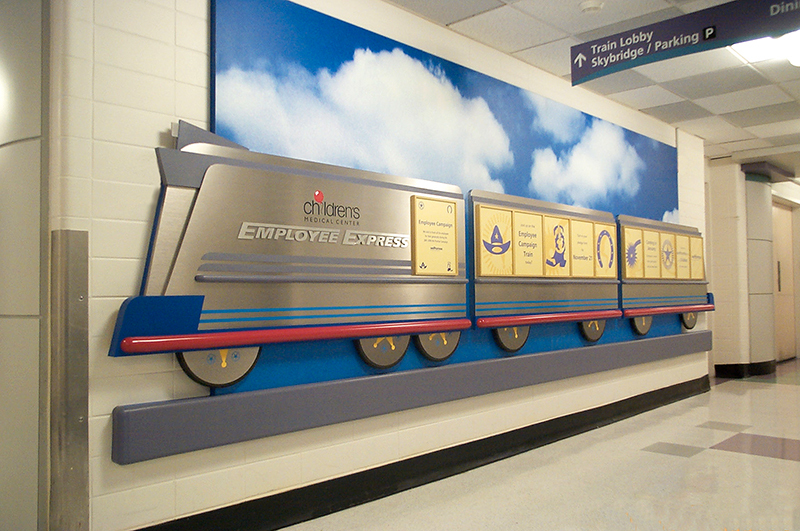 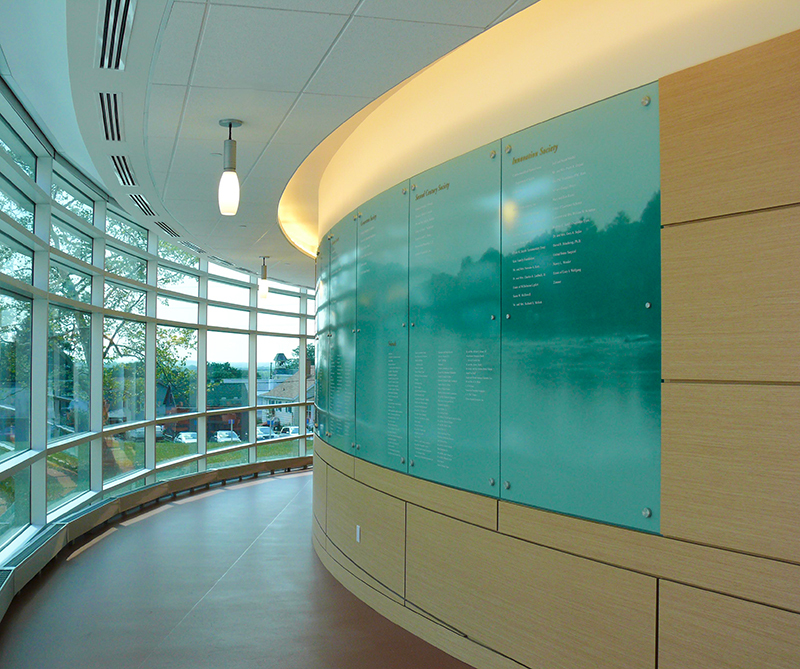 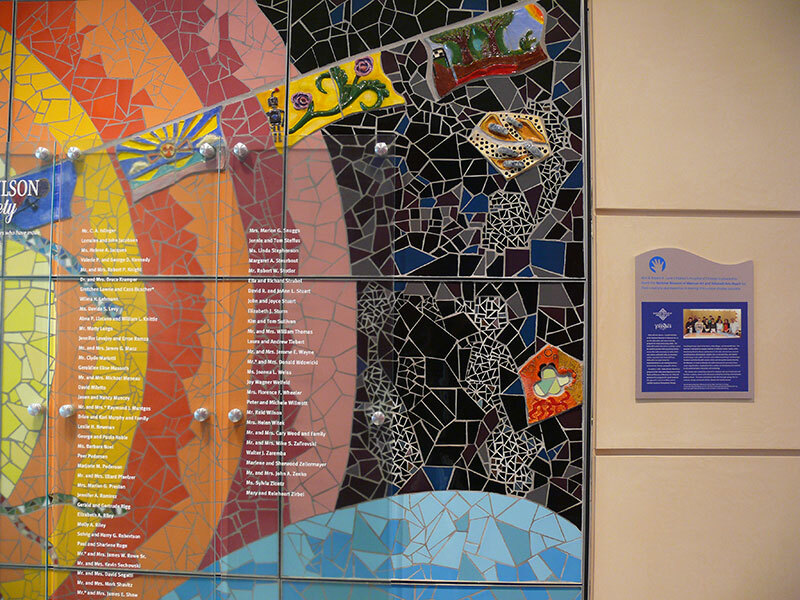 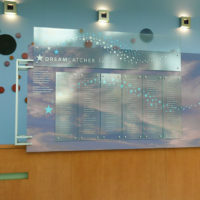 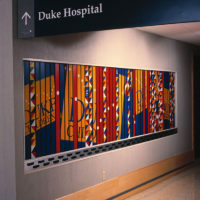 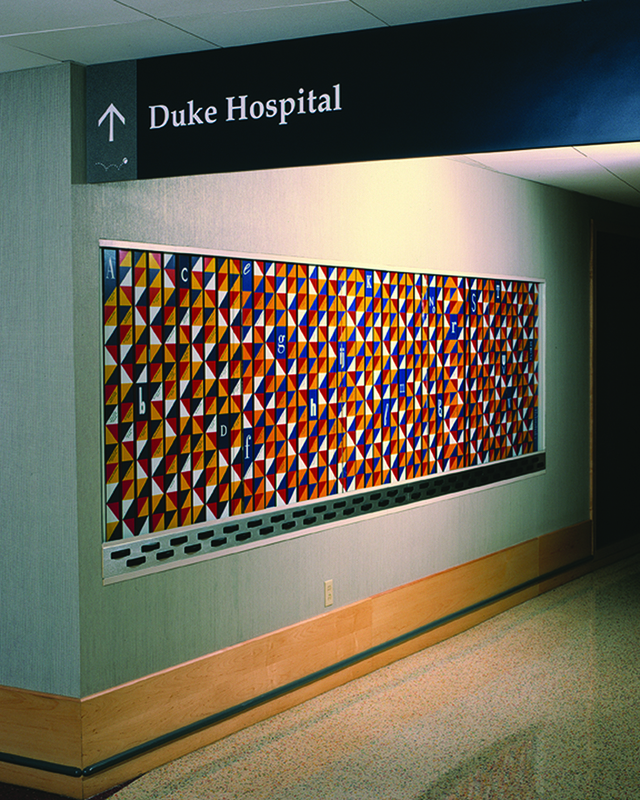 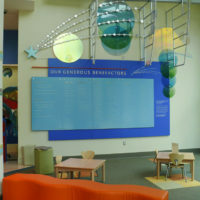 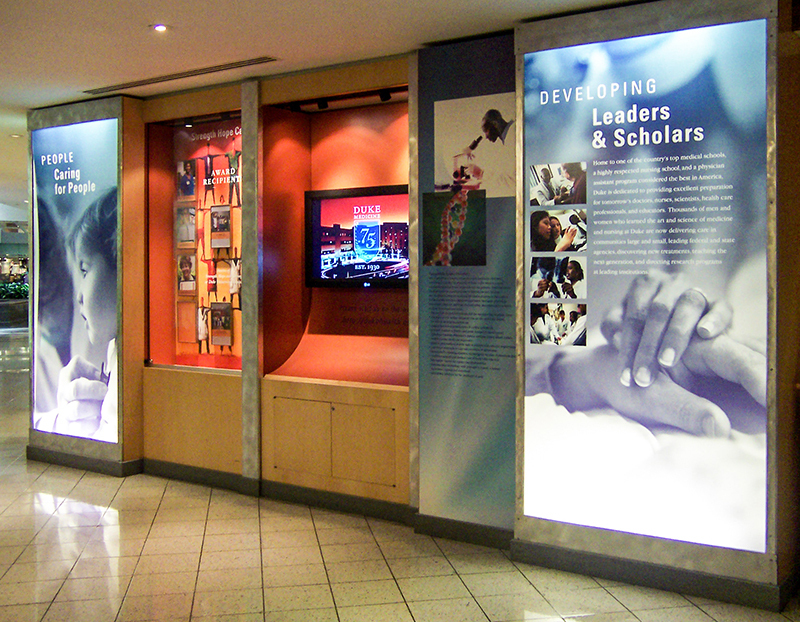 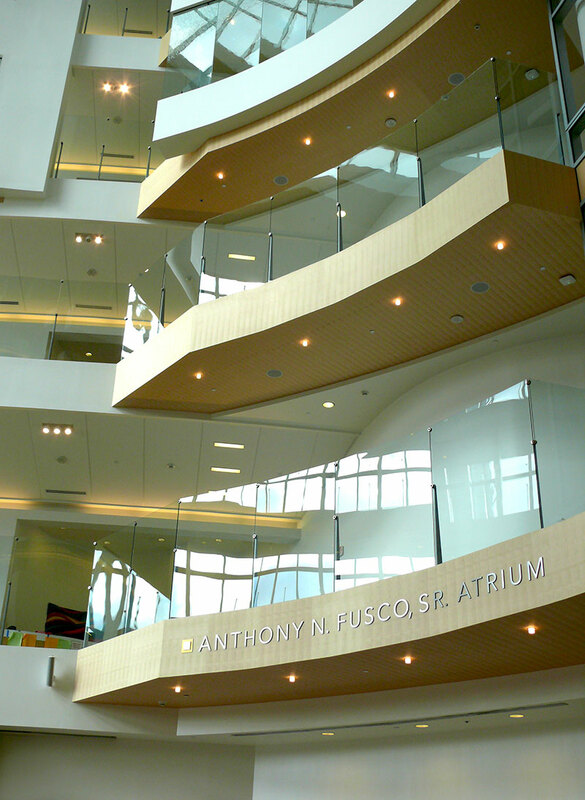 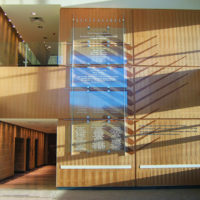 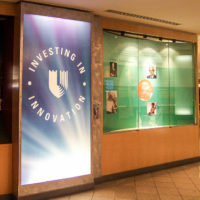 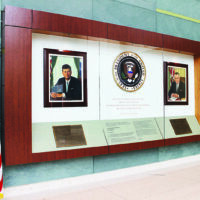 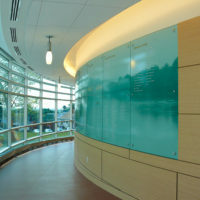 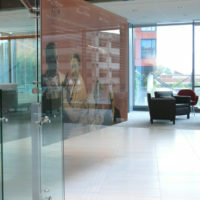 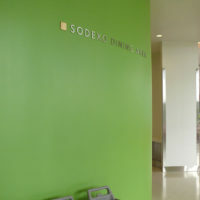 The Mitchell design team focused on design criteria for a comprehensive graphic identity and donor recognition program that would complement the architecture by utilizing materials that captured the copious amount of light in the atrium and corridor spaces to attract attention to the graphic displays. 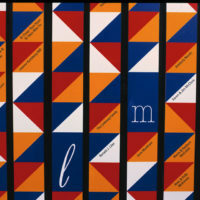 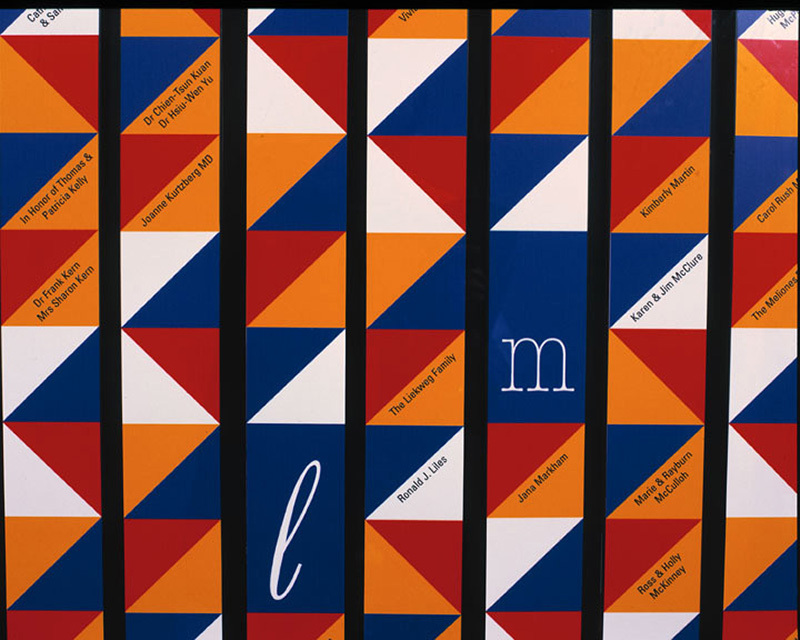 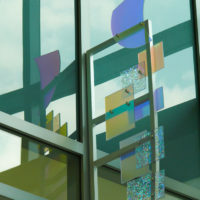 The overall design theme used layered transparent and translucent materials in colorful and festive shapes. 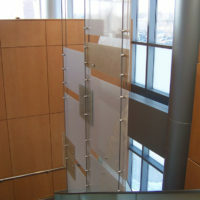 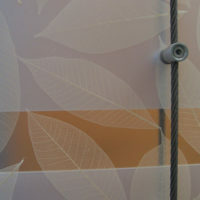 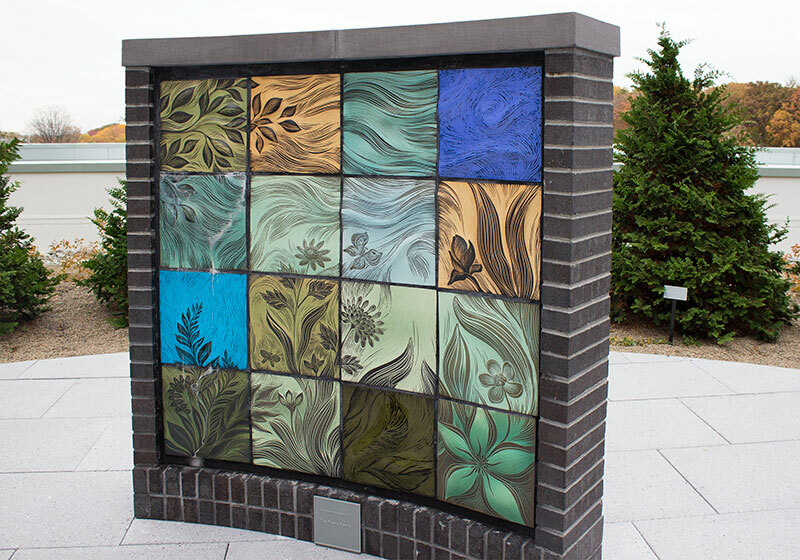 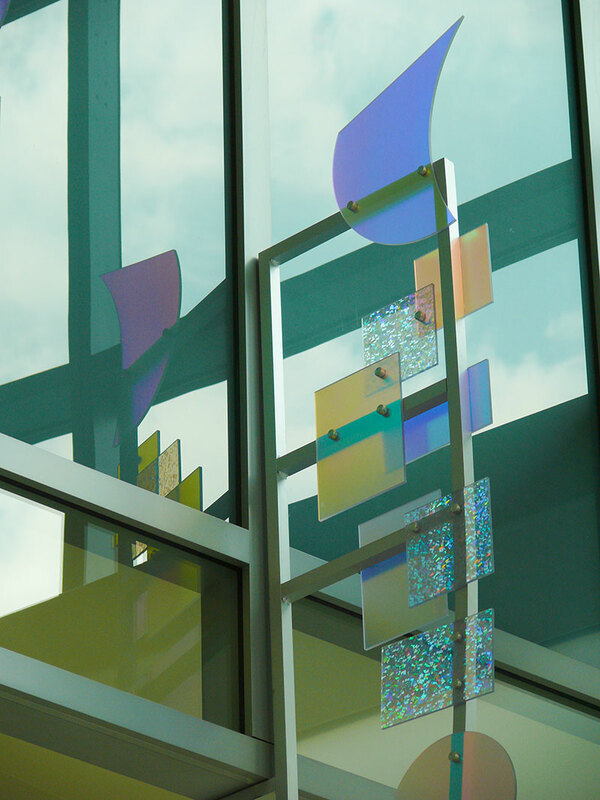 Designs incorporated dichroic glass panels to add an element of discovery, variation, and surprise. 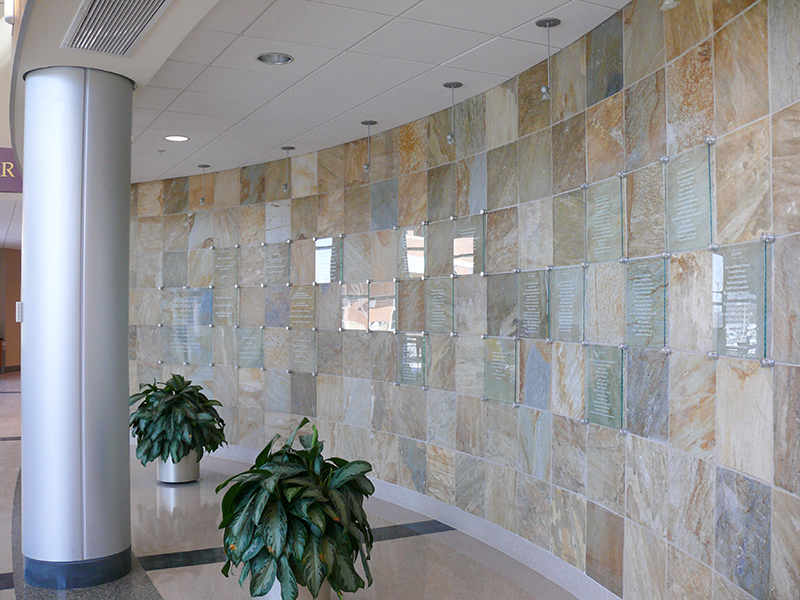 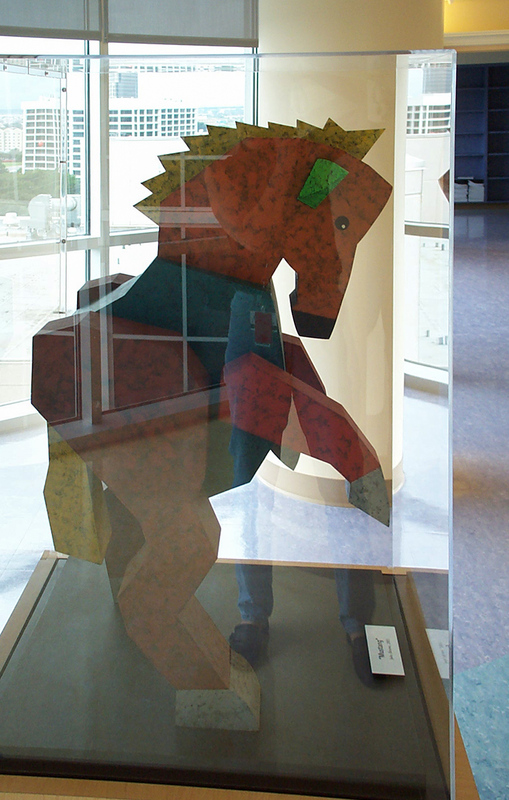 Located in the new Heart and Vascular building lobby, the materials used in this display consisted of different textures and finishes. 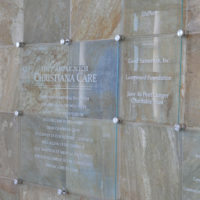 Brushed aluminum bars, decorative acrylic refractors, and textured laminate with a shadow changing wave effect captured, reflected and moved light across the surface of the display. 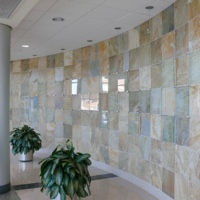 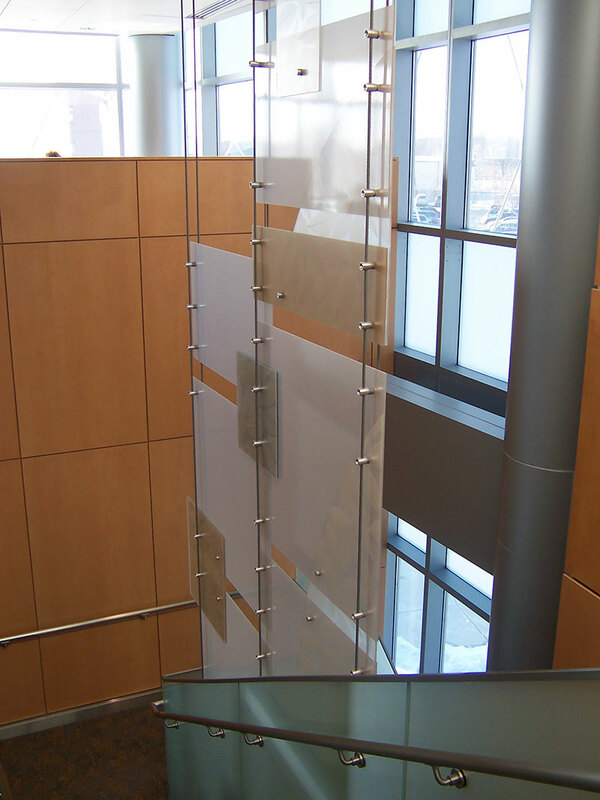 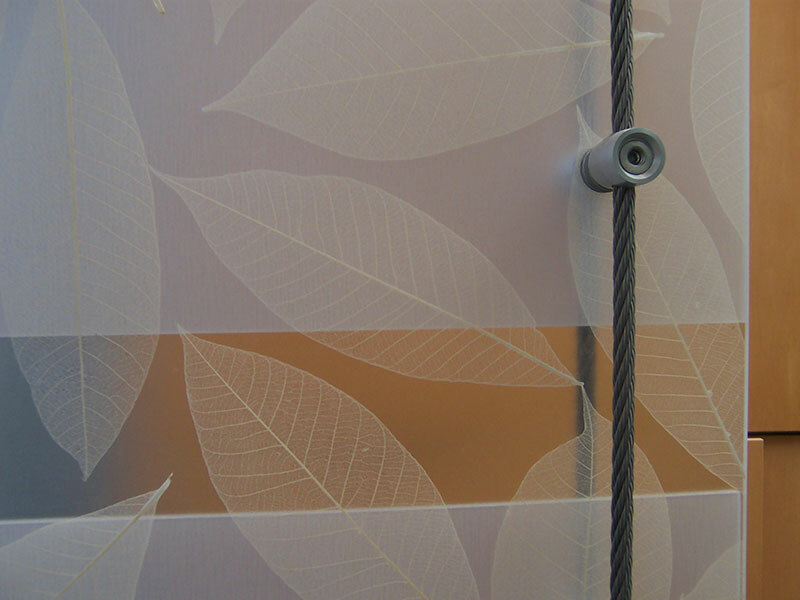 Solid surface and frosted finish acrylic of different thicknesses were used to create a layered “strata” appearance as if emerging through the wall. 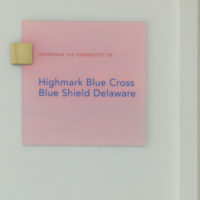 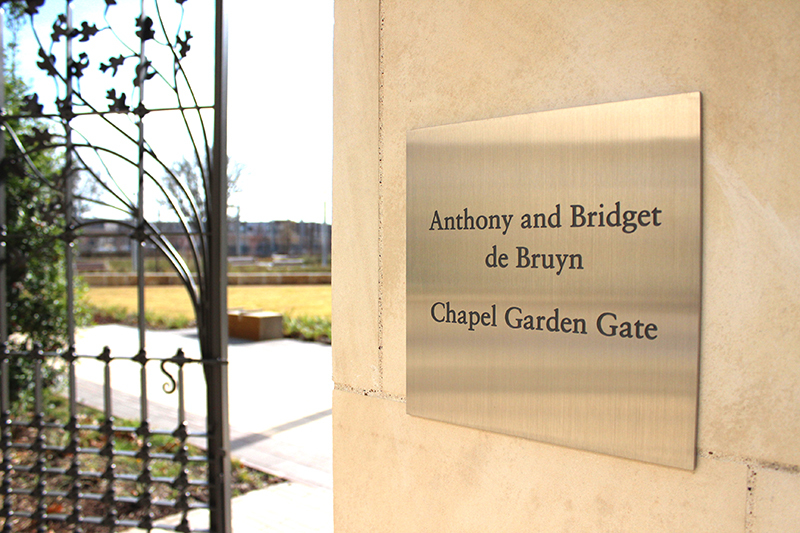 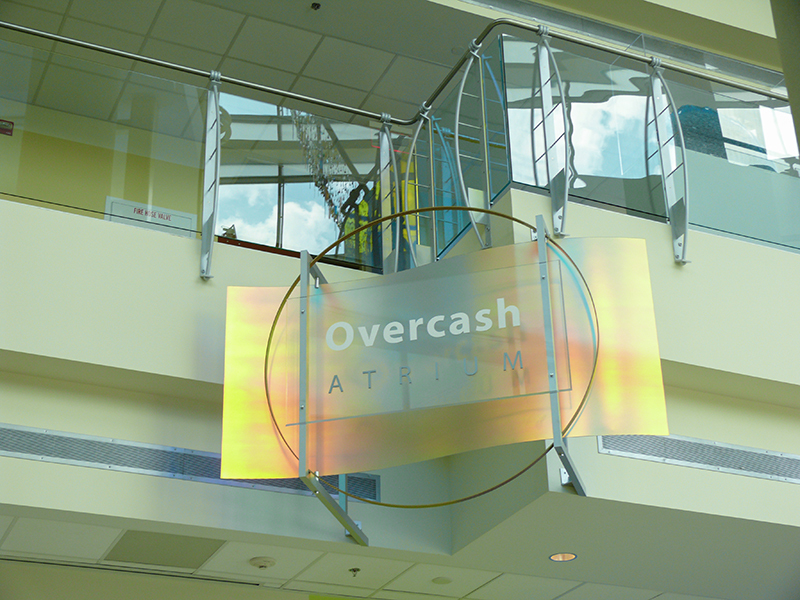 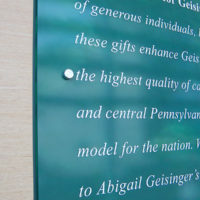 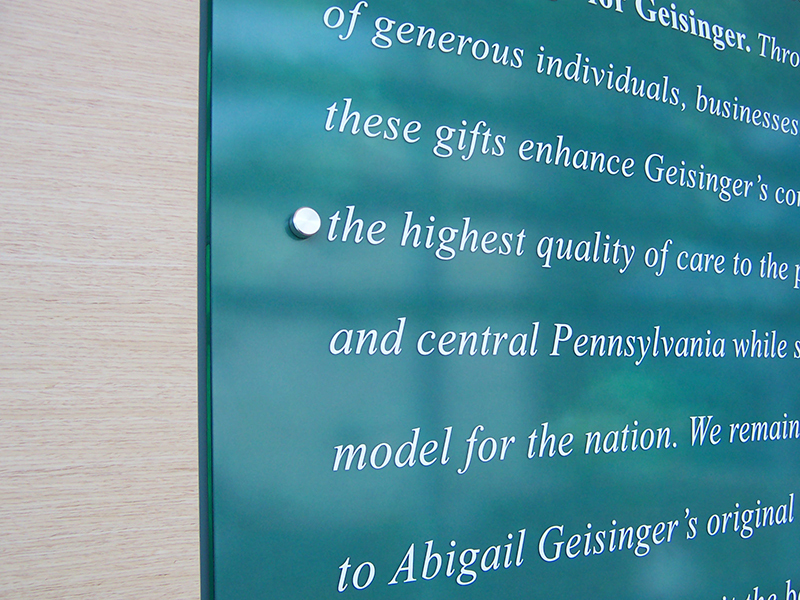 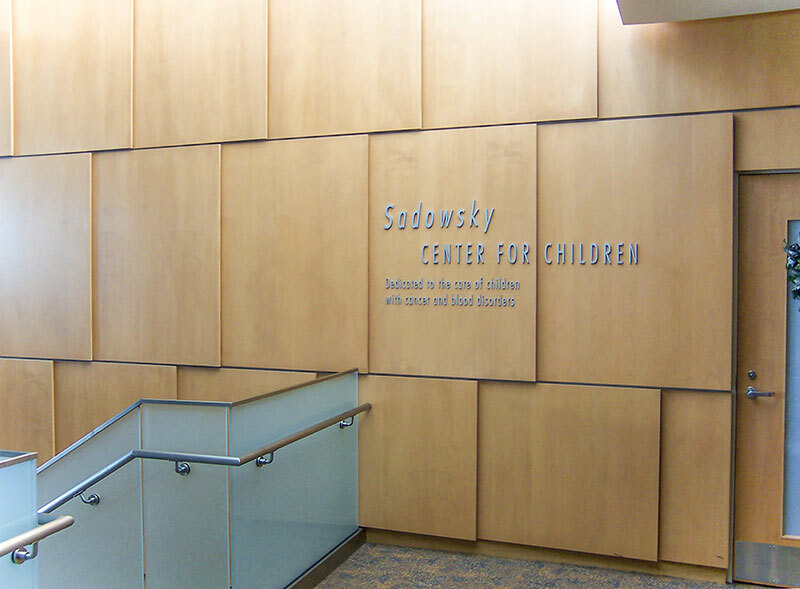 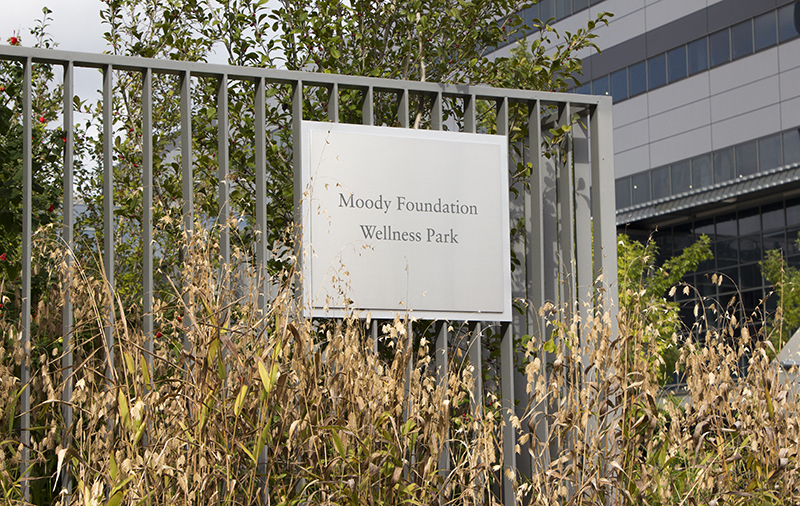 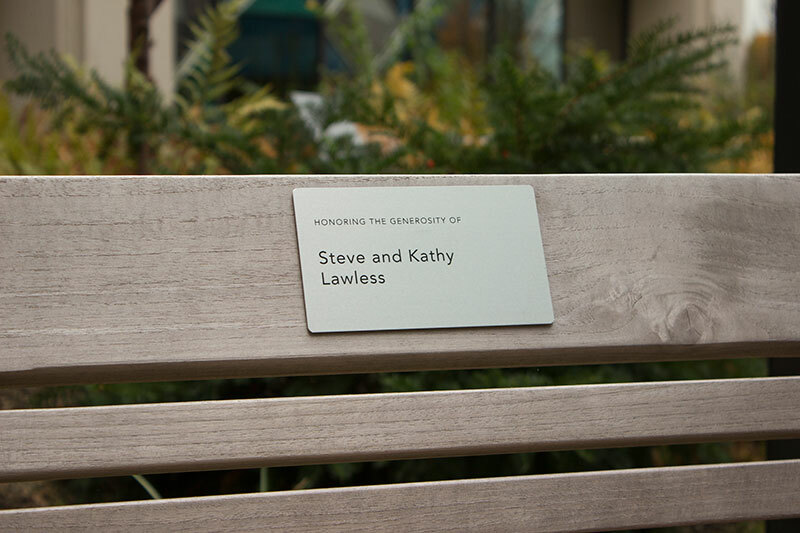 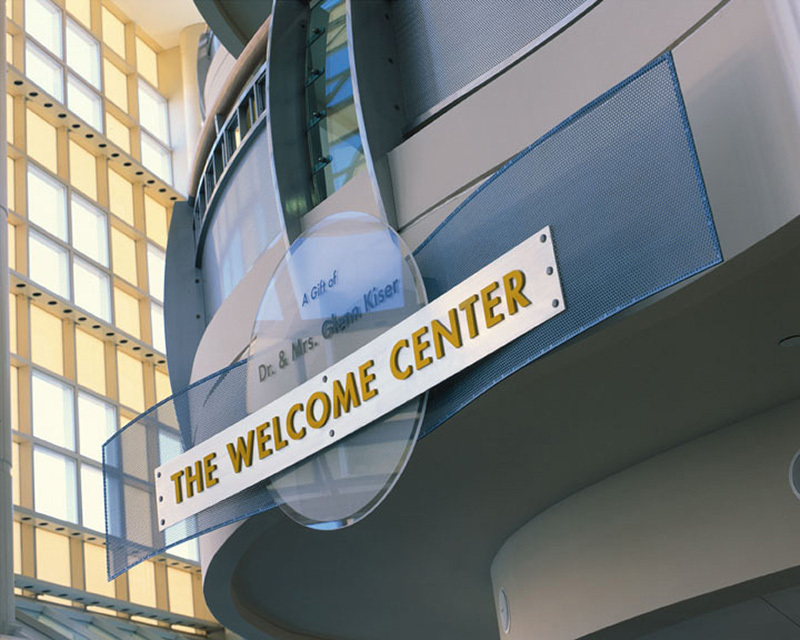 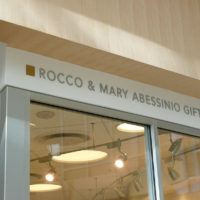 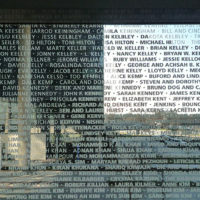 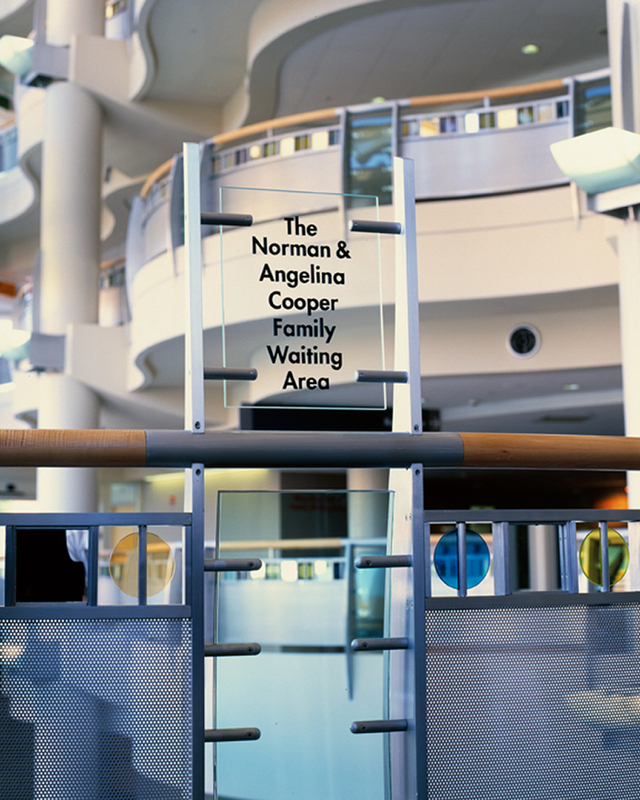 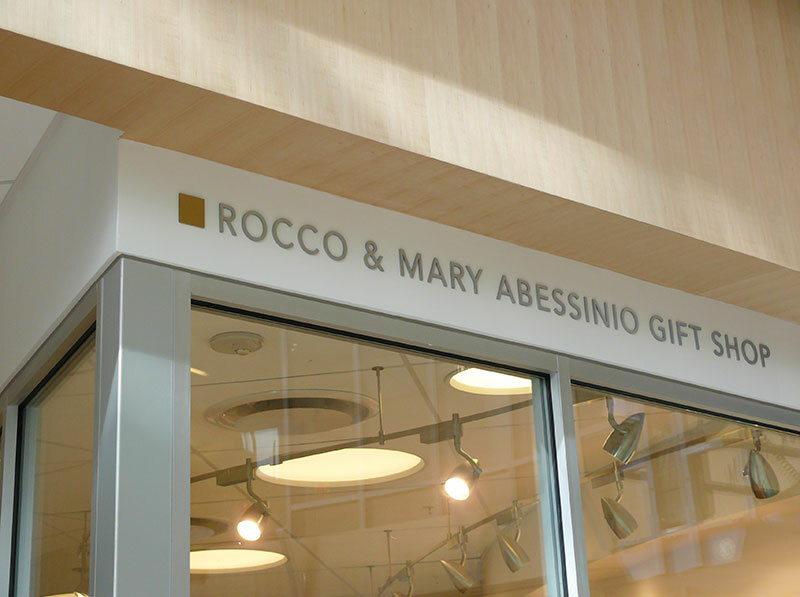 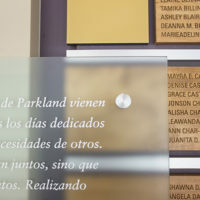 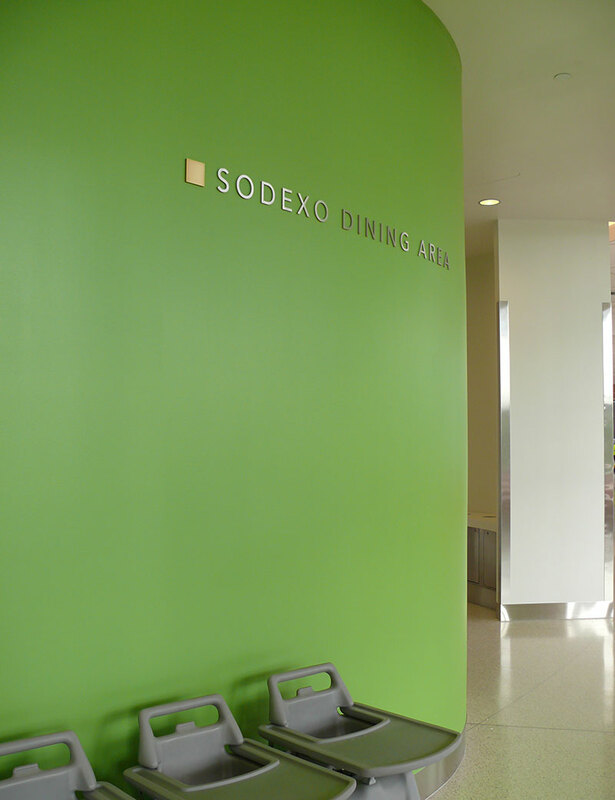 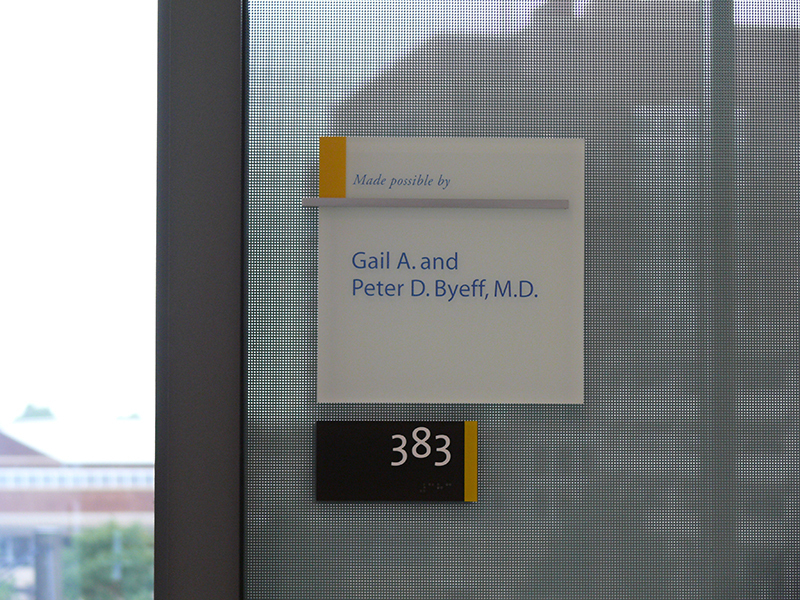 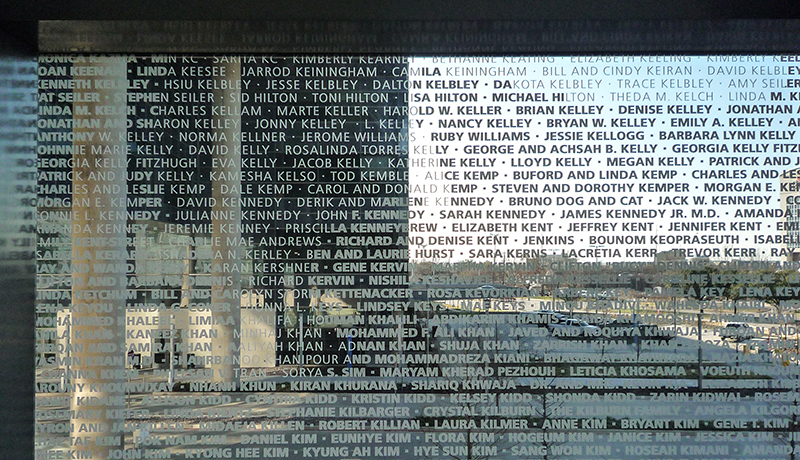 To compliment architectural details on the convex curved wall, dimensional aluminum letters of different heights and thickness were used for donor names to denote giving levels. 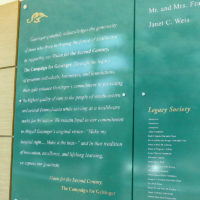 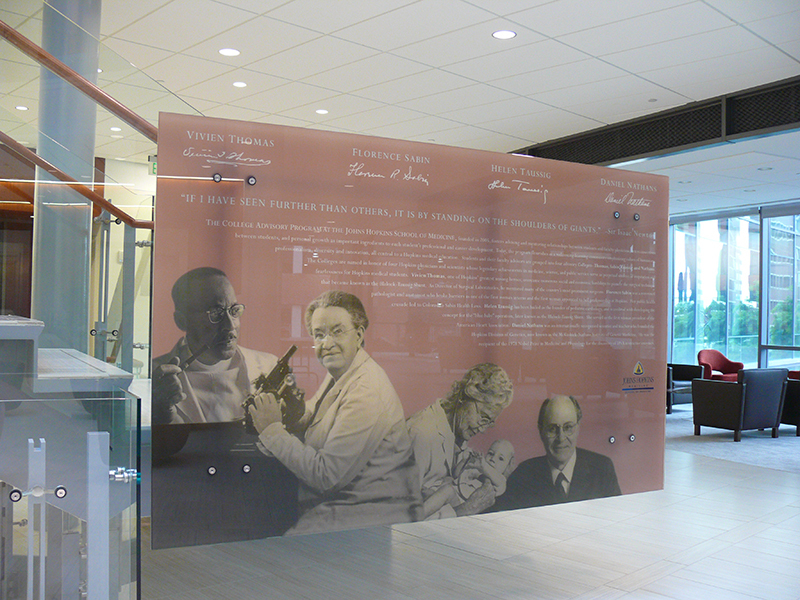 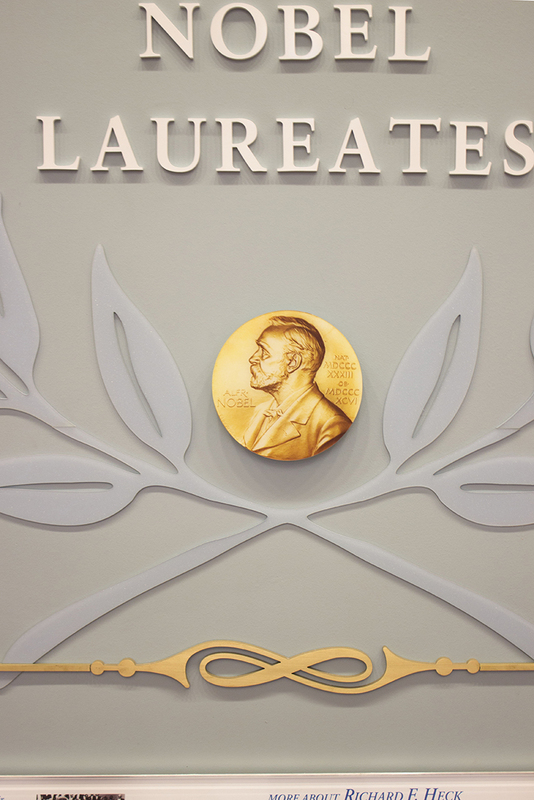 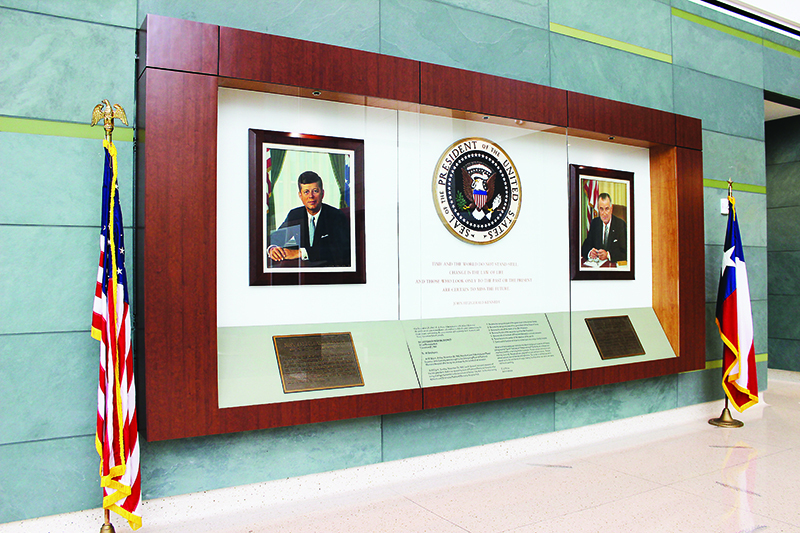 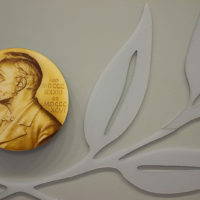 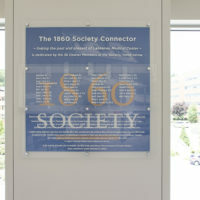 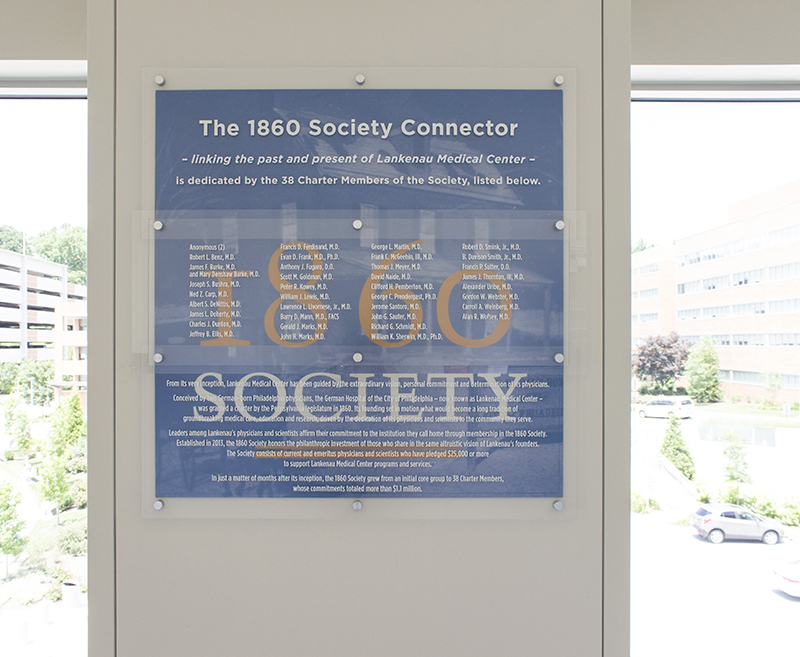 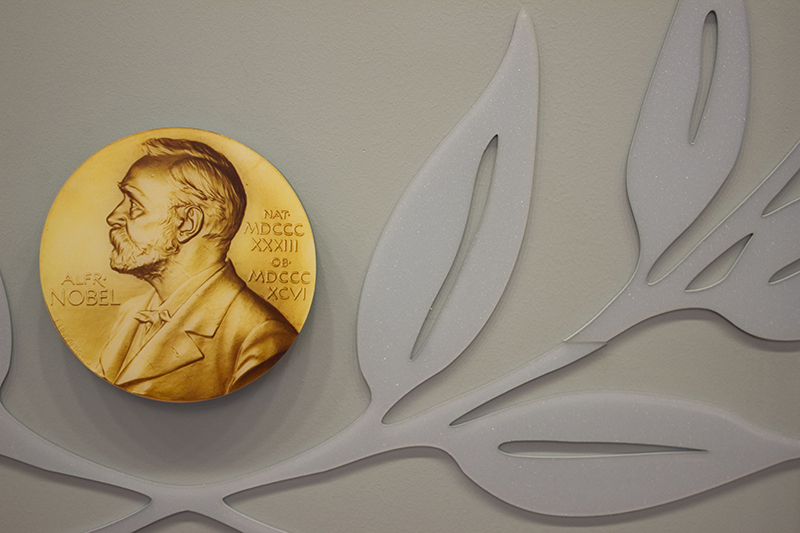 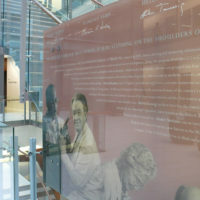 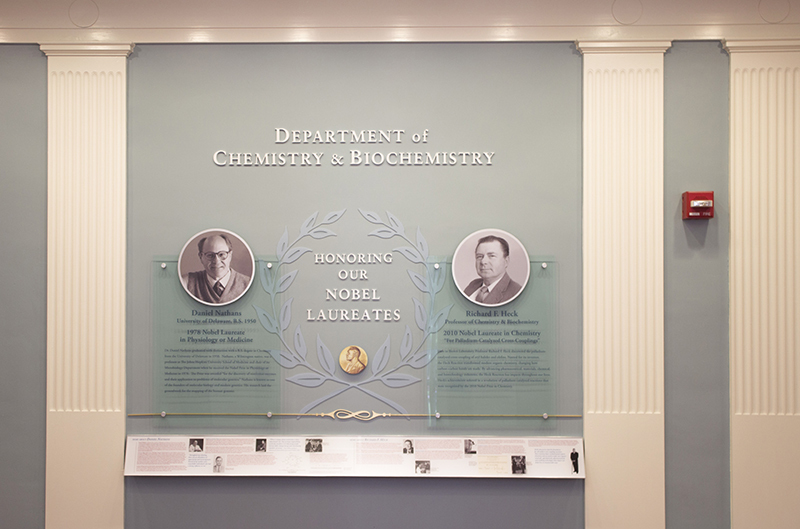 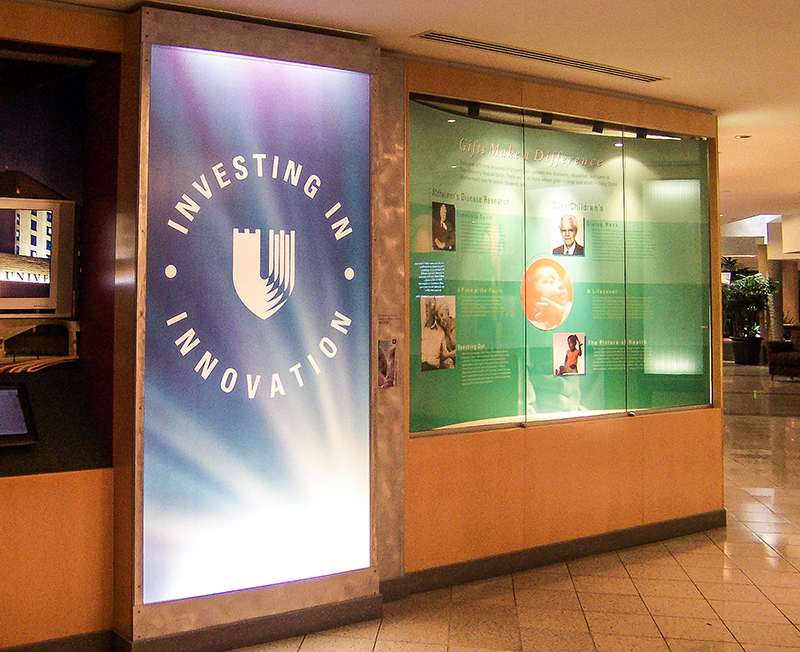 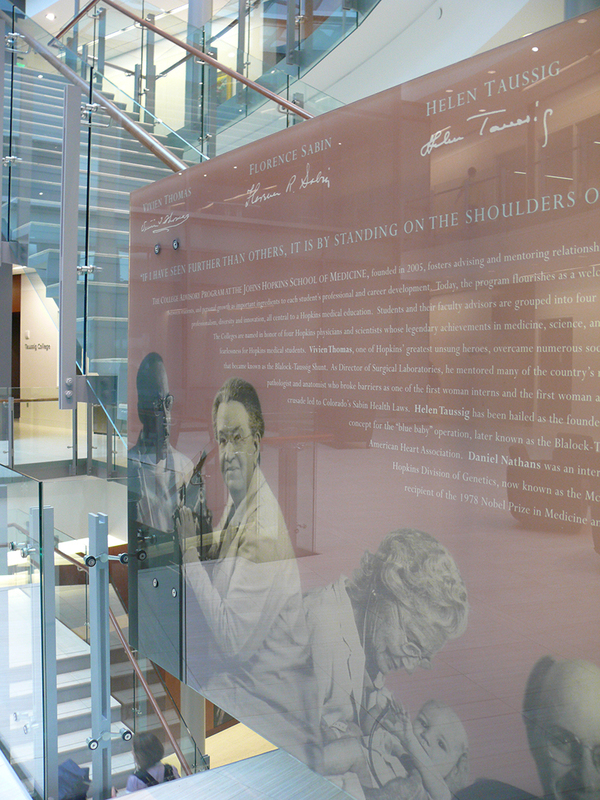 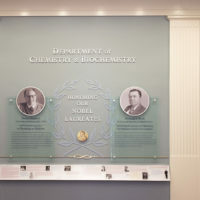 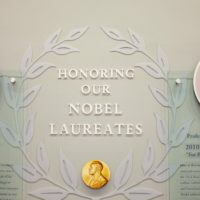 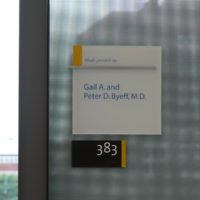 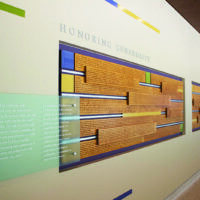 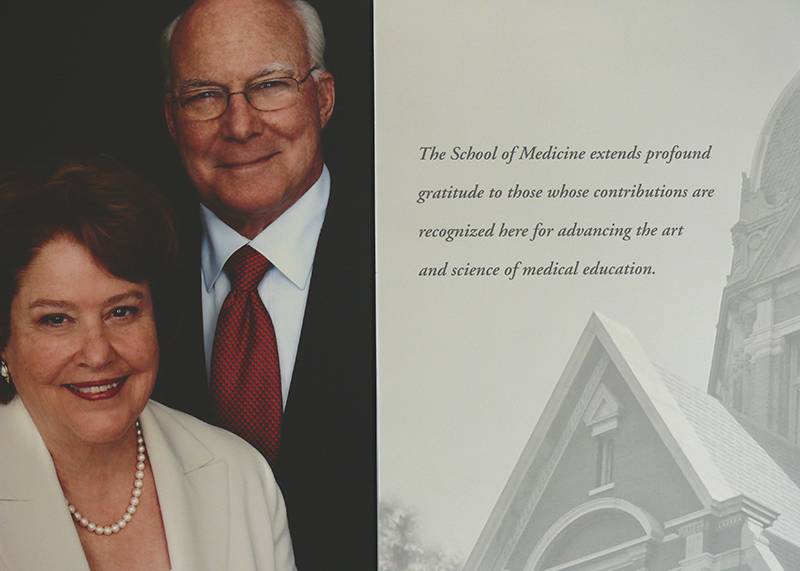 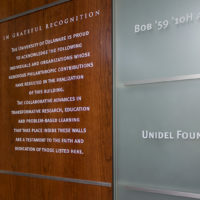 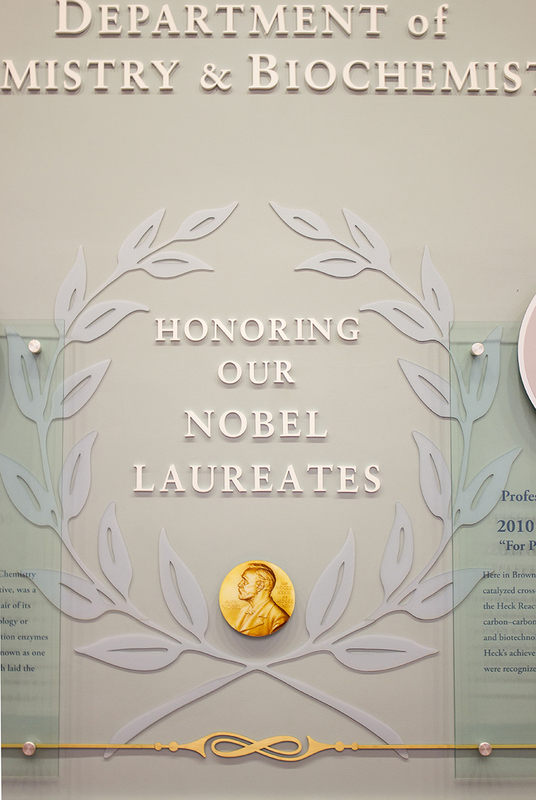 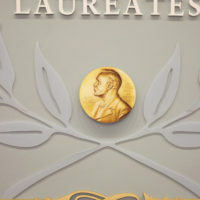 A new display honoring the University of Delaware’s two Nobel laureates is the first thing students and visitors see as they enter the lobby of Brown Laboratory on the Newark, Delaware campus. 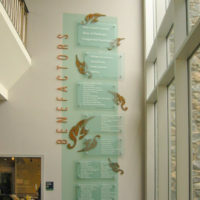 Designers from our recognition design studio and technicians from our fabrication shop created and installed the display. 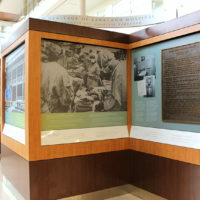 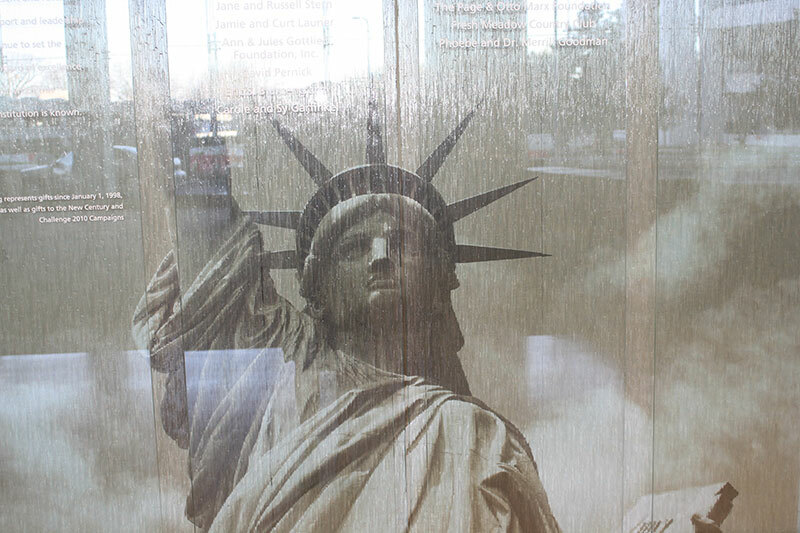 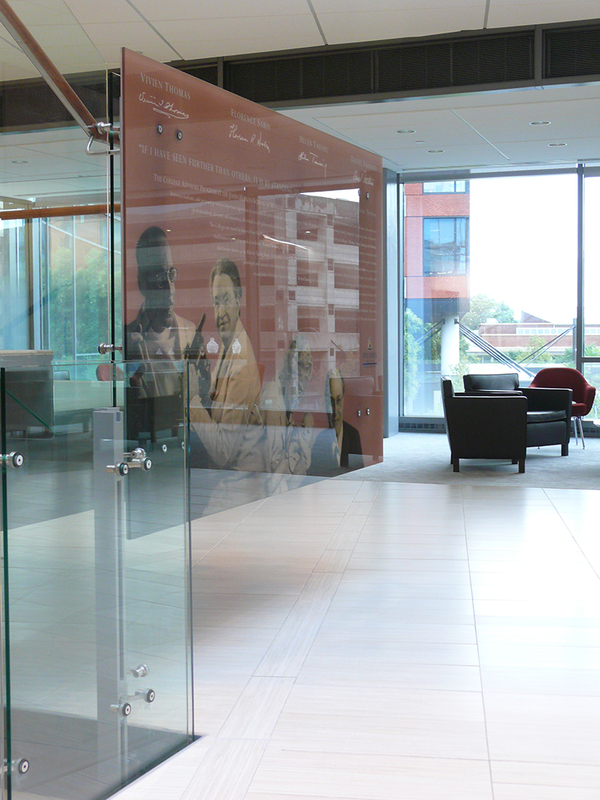 Existing wall mounted column reliefs in the lobby were used to frame the display. 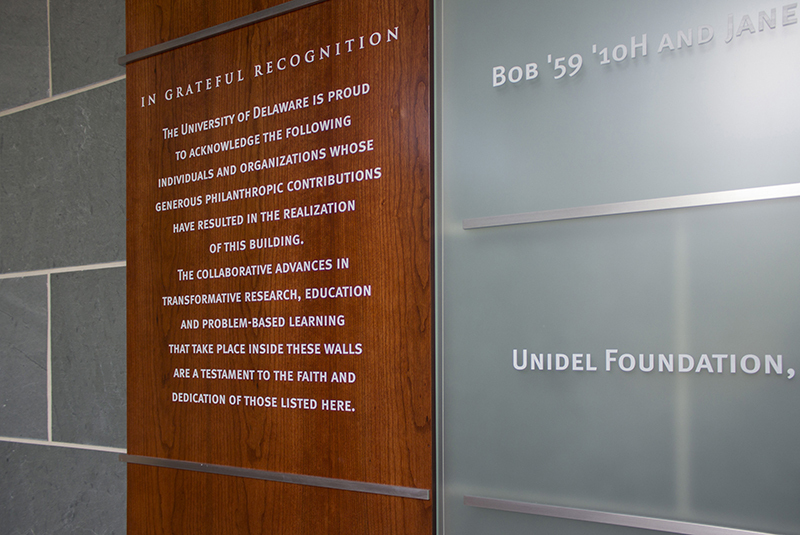 A replica Nobel metal, dimensional wreath and decorative metal band highlight symmetrical sepia toned images and glass text panels of UD alumnus Daniel Nathans and faculty member Richard Heck. 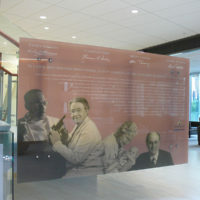 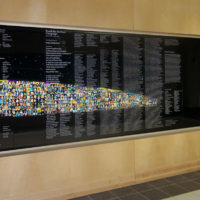 A graphic timeline rail is featured below with parallel text and images of historic research milestones in Chemistry and Biotechnology sciences.